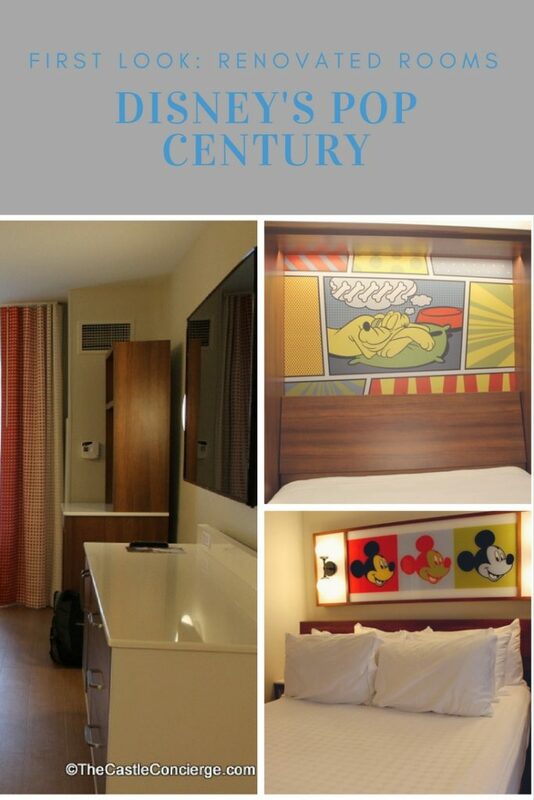 We just checked in (June 11, 2017) to Disney’s Pop Century Resort at Walt Disney World and were given one of the refurbished rooms! Here’s a photo tour of our room in the 90’s section in building 8. 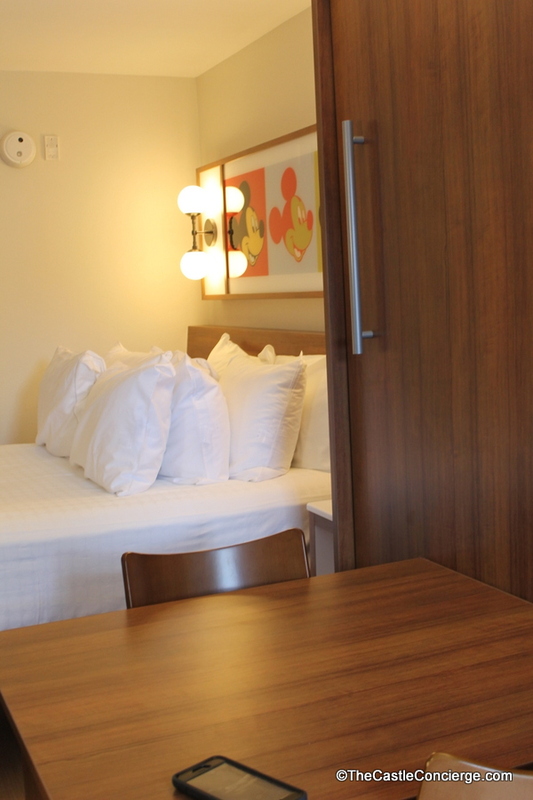 At first glance, the room is very white (almost stark) with mid-century modern furniture. 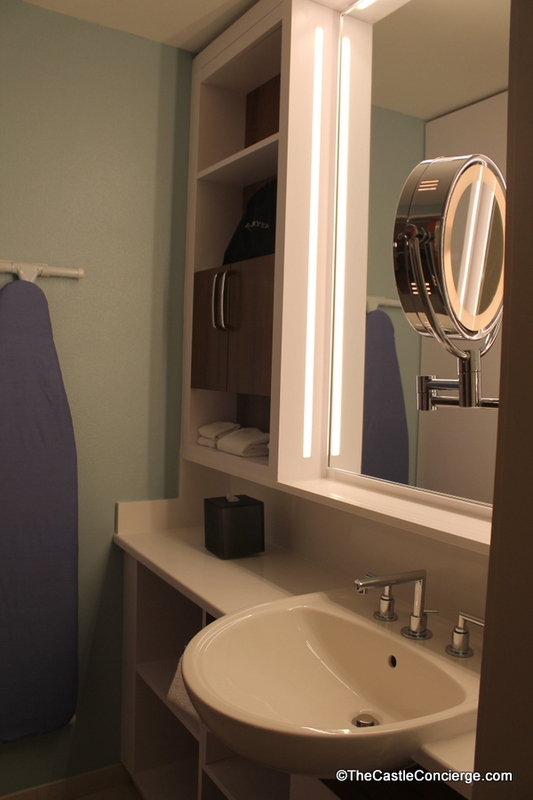 Everything from top to bottom has been refurbished. 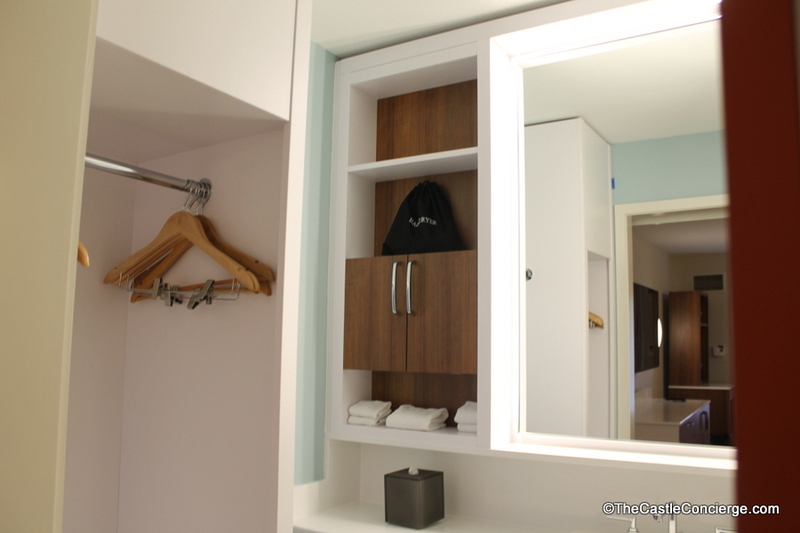 In fact, there are no hints of the old rooms in the decor or linens. 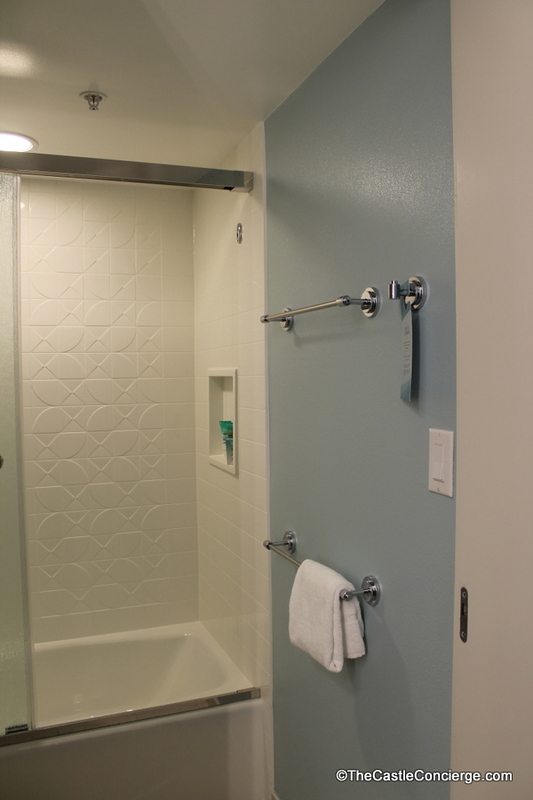 As you look closer, you’ll seed that the renovation has added some wonderful conveniences to the rooms at this Disney World value resort. 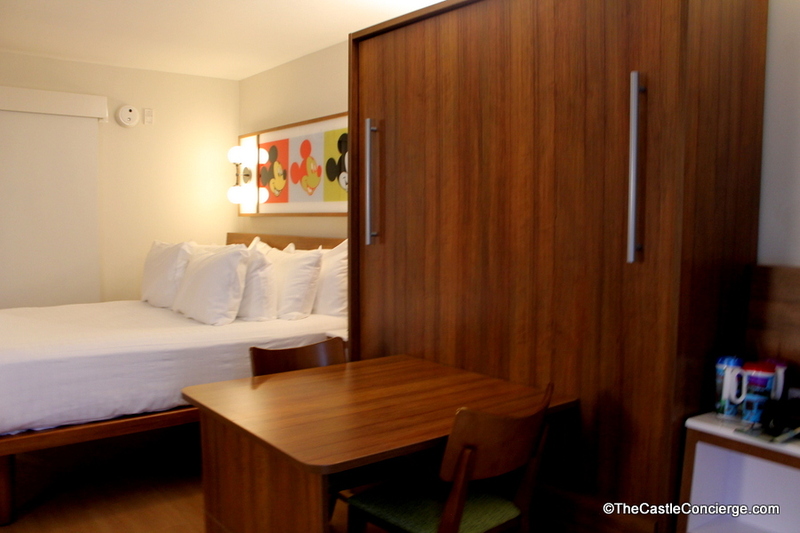 Queen Bed and Double Murphy Bed/Table are now featured in the rooms at Pop Century. 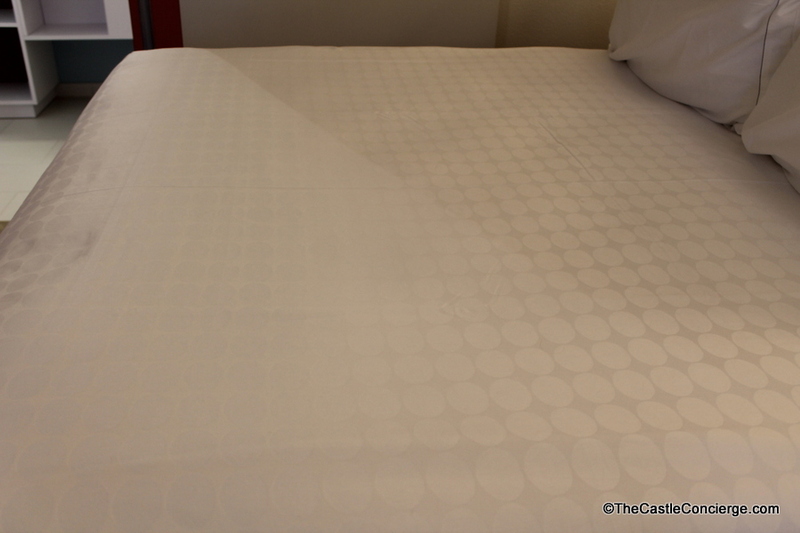 After two nights sleeping in the queen bed, I can say that the extra space was wonderful. However, the mattress seemed a bit hard to me; my husband felt it was absolutely fine. 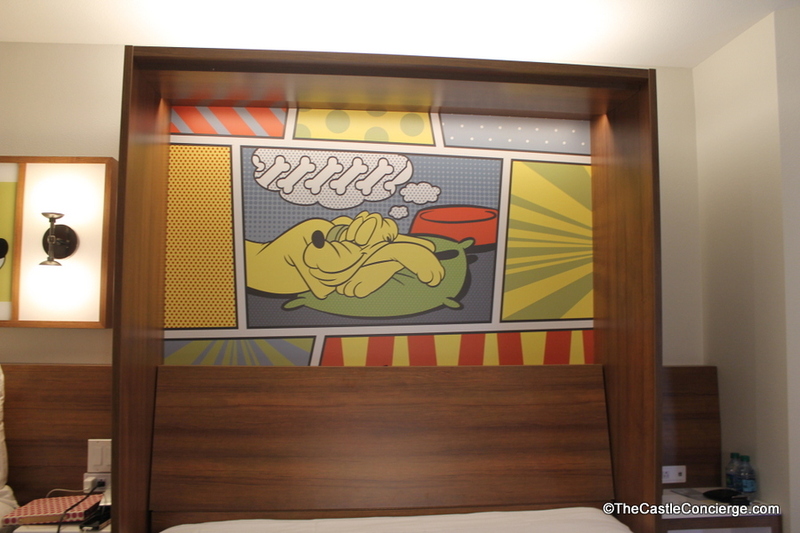 If you like sleeping on a firm mattress, the Disney’s Pop Century renovated room is for you. 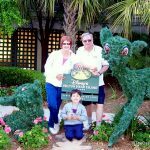 It wasn’t the worst that I’ve ever slept on and I did get much better sleep than in the previous double bed accommodations offered at the value resorts in Walt Disney World. 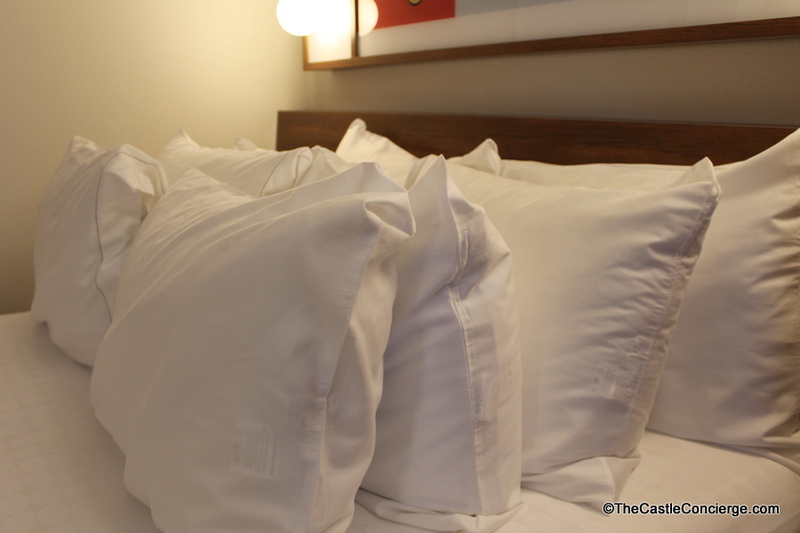 The pillows were just right; not too soft and not too hard. Medium pillow lovers will like them. 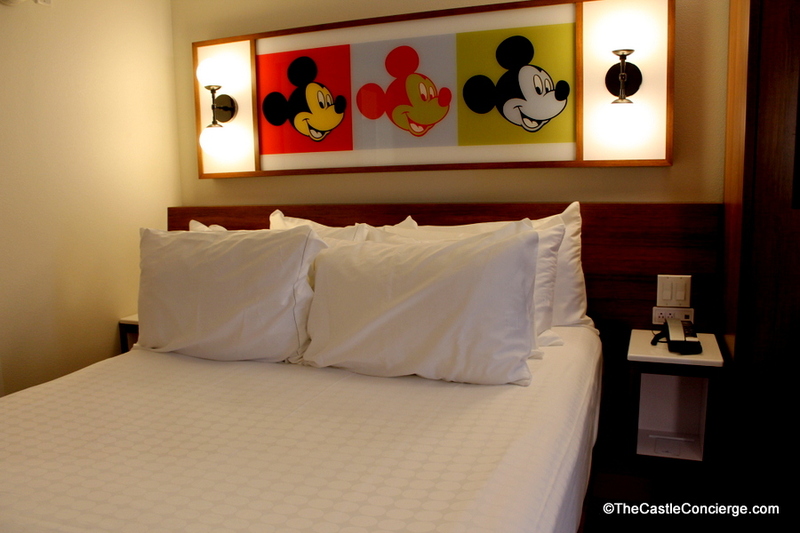 The lighting above the queen bed adds a pop of Mickey to the room. 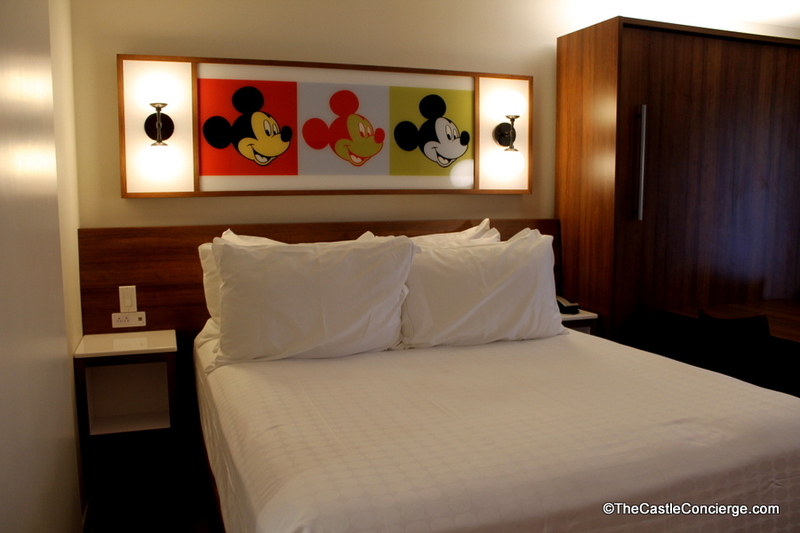 Mickey Mouse lighting fixture above queen bed in Disney’s Pop Century. 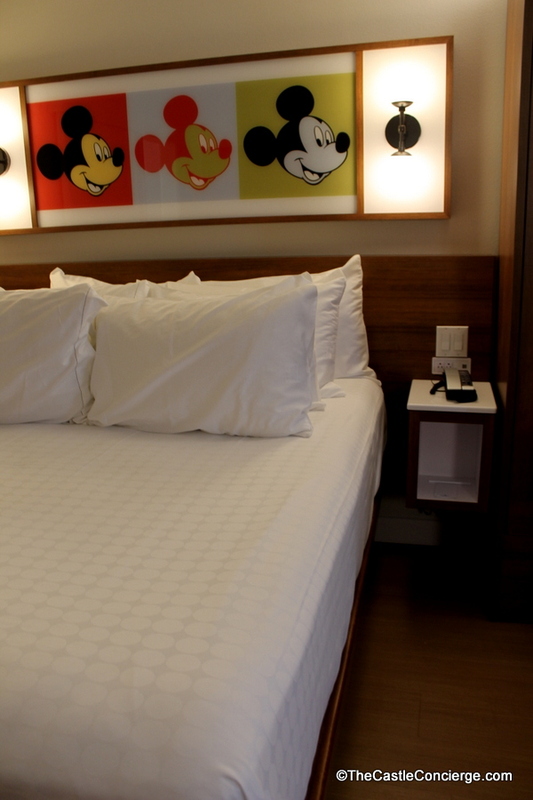 Queen Bed at Pop Century in Walt Disney World. 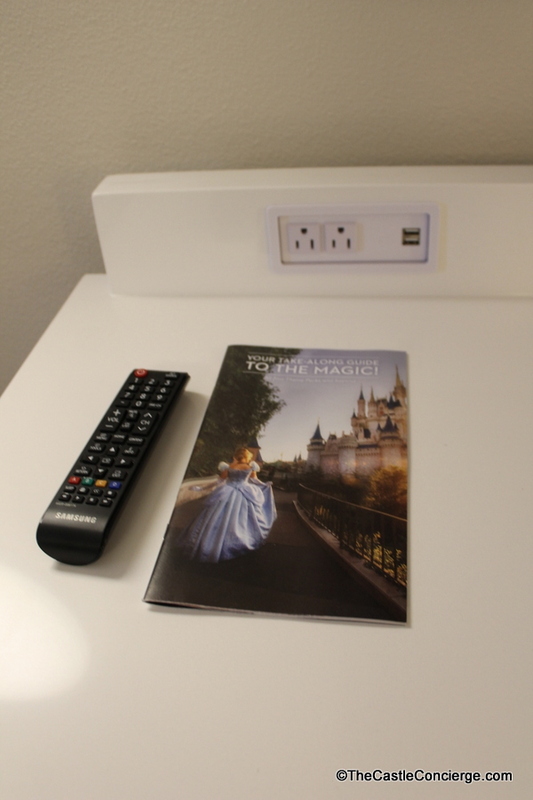 Our family found the outlets and USB charging ports next to the beds to be extremely convenient. 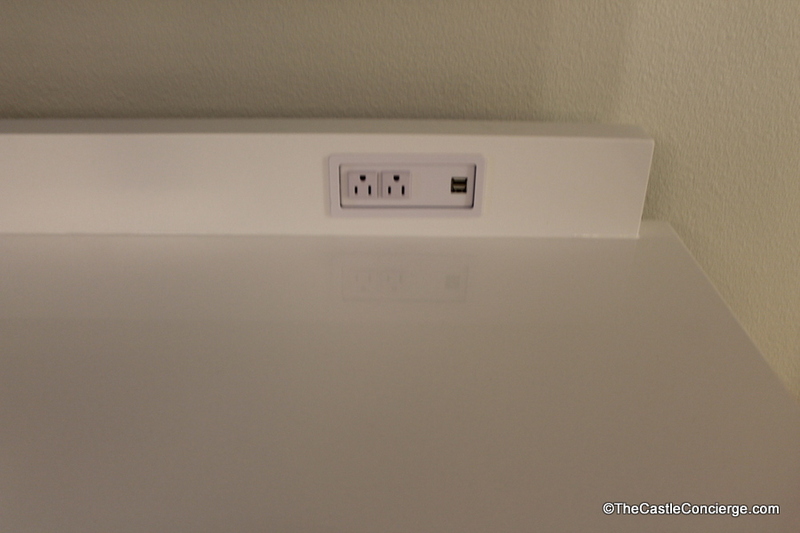 I had my iPhone, iPad, and laptop all plugged in at my nightstand area. 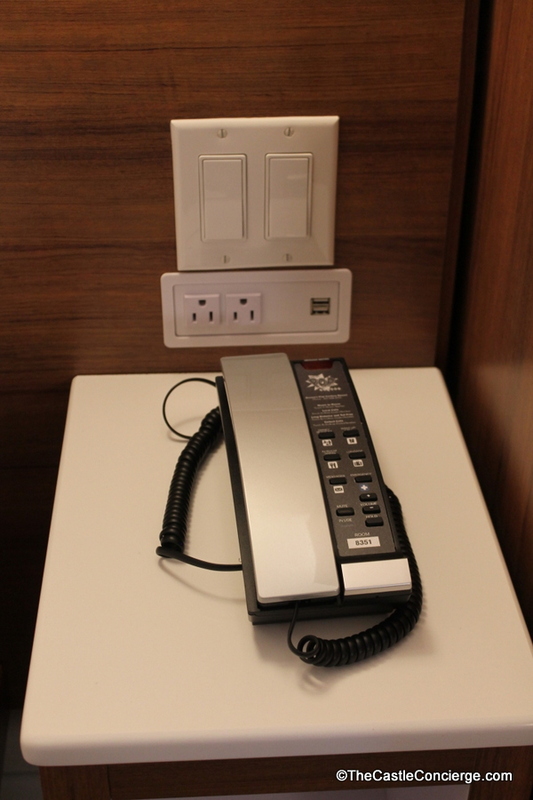 There is still a bedside phone. Retrieving messages was simple. 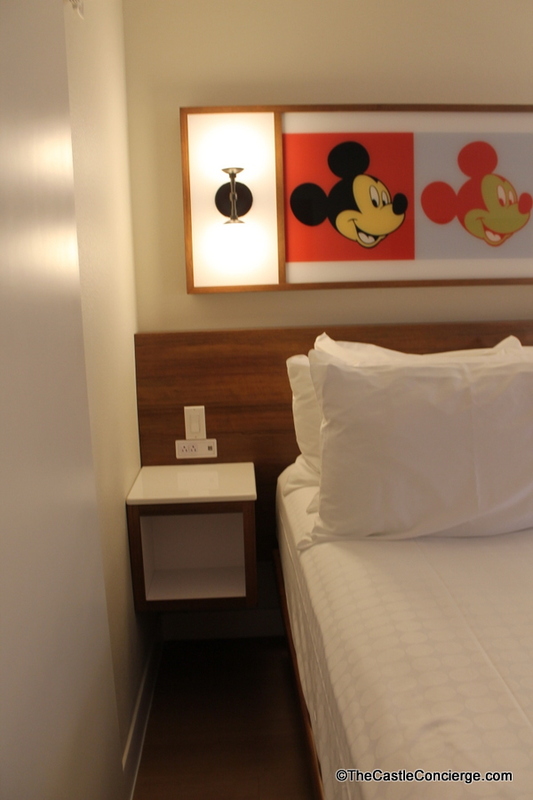 Cozy queen bed with nightstand at Pop Century. 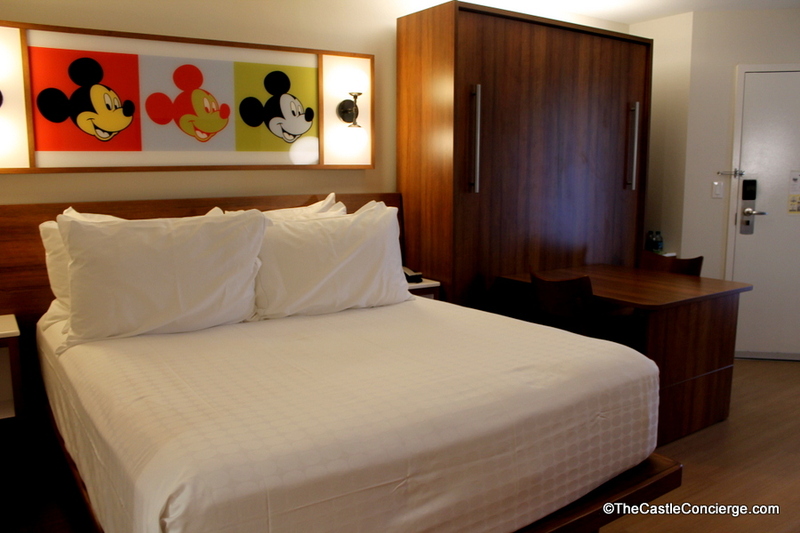 Queen Bed with two nightstands at Pop Century in Walt Disney World. 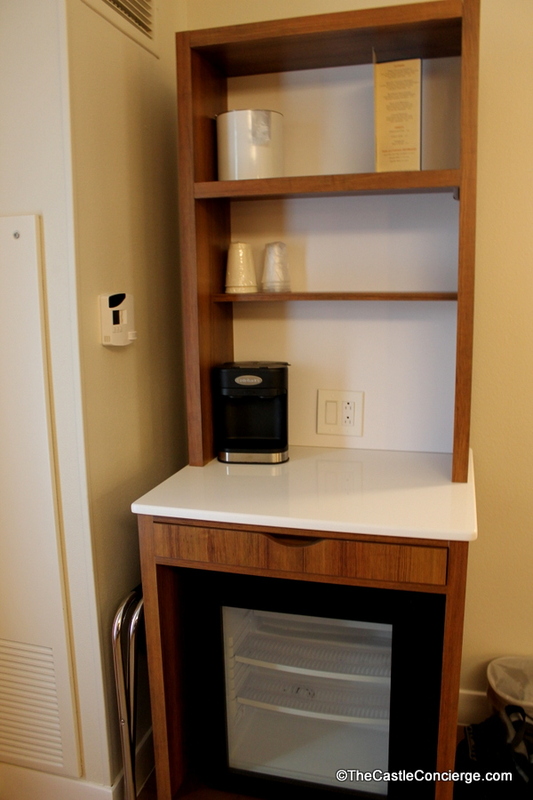 Coffee Bar, Ice Bucket, Cups, and Refrigerator at Pop Century. Large flat screen television now playing Avatar. 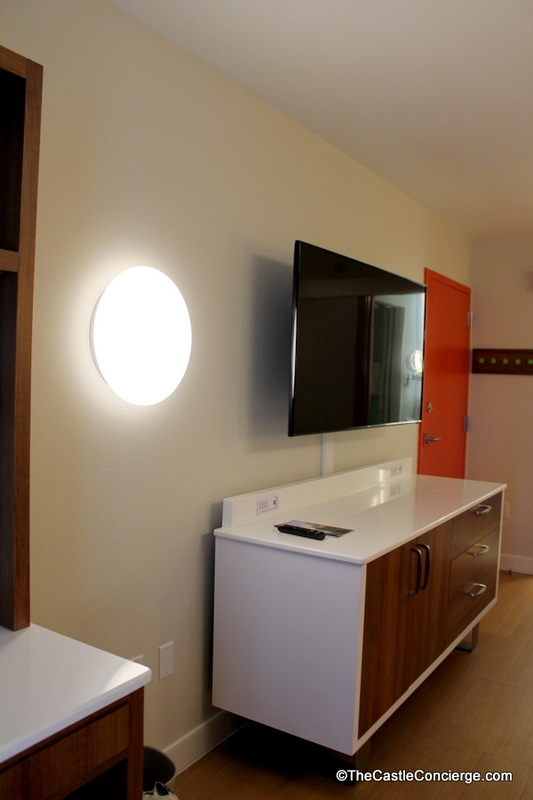 The room seems larger with the lighter wall color and functional furniture. 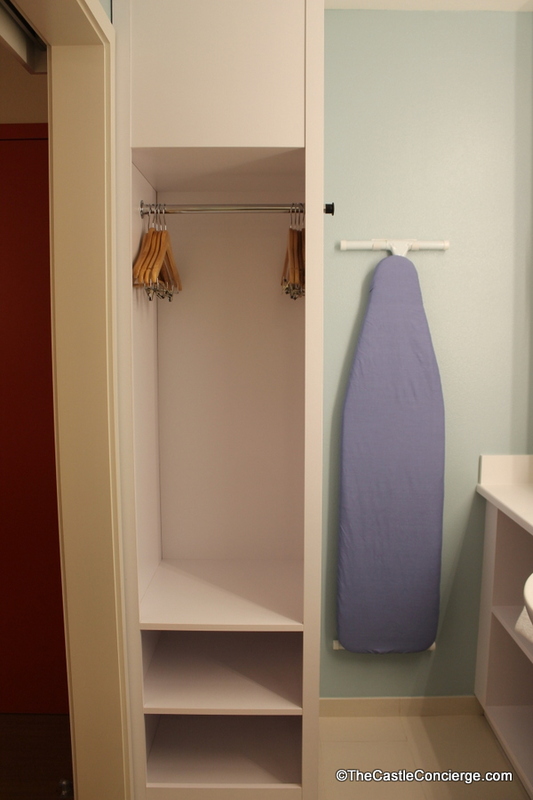 Luggage can easily be stored under the queen size bed. 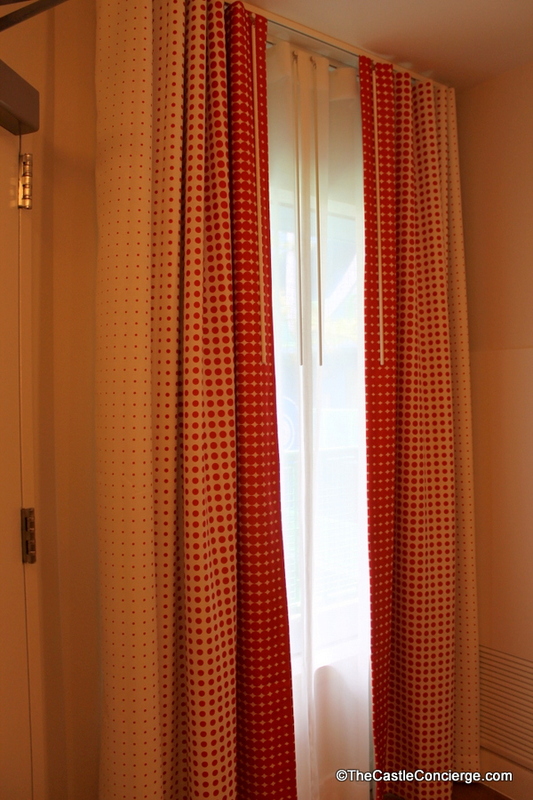 The room refurb includes all new textiles, including these groovy orange curtains. 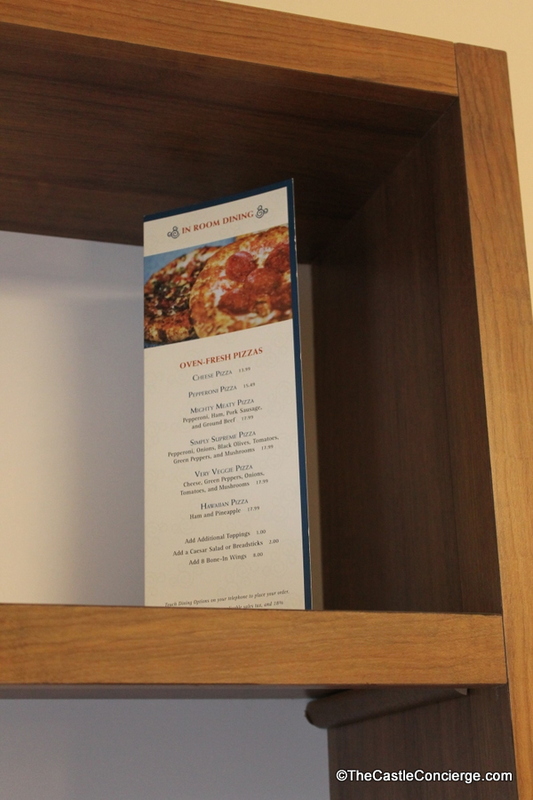 In-room dining information is found in a handy pamphlet. 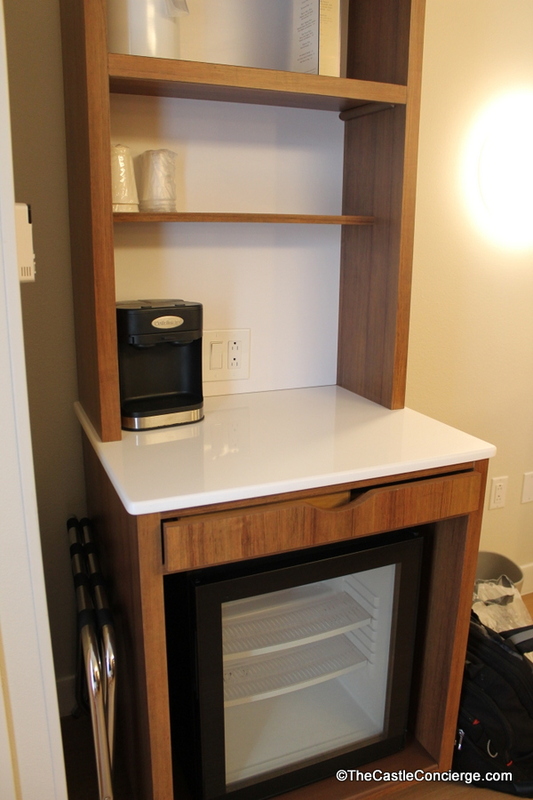 I like the fridge and coffee bar area for convenience. 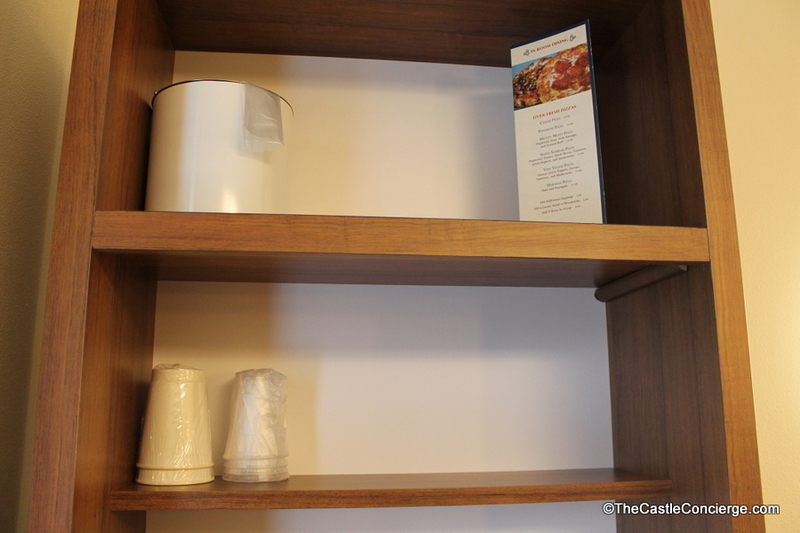 It’s also a good place to stash the treats that you bring back from the food court or resort bakeries. 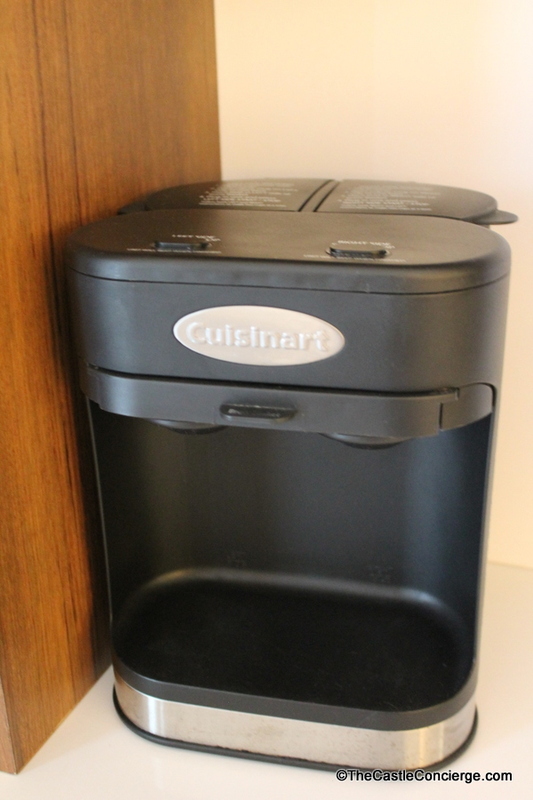 You’ll find a Cuisinart coffeemaker, cups, and ice bucket on the shelves. 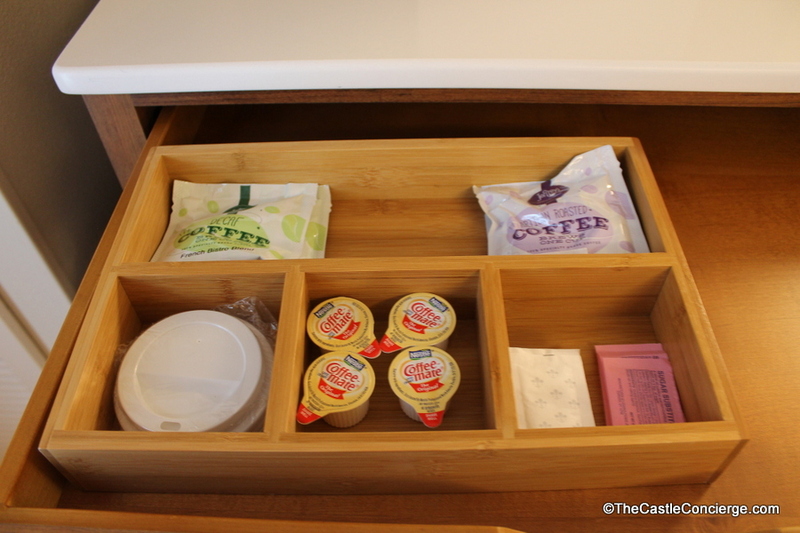 Look for supplies in the drawer. 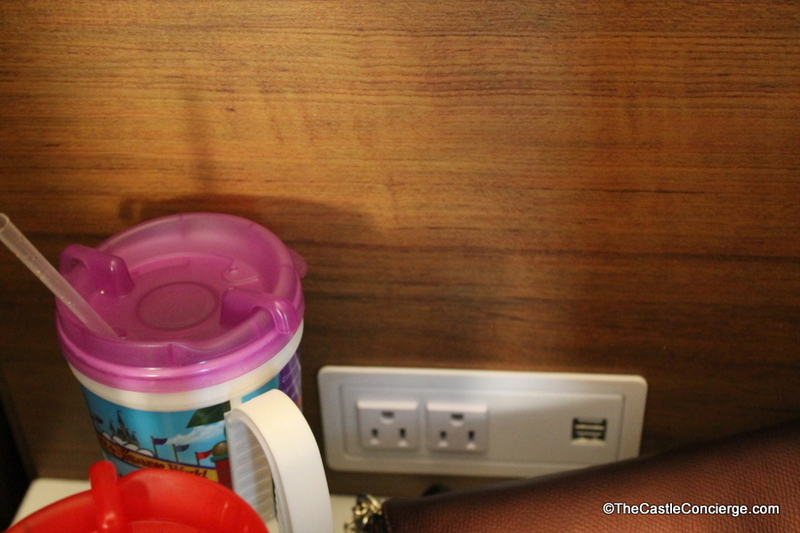 Cup lids — yes! 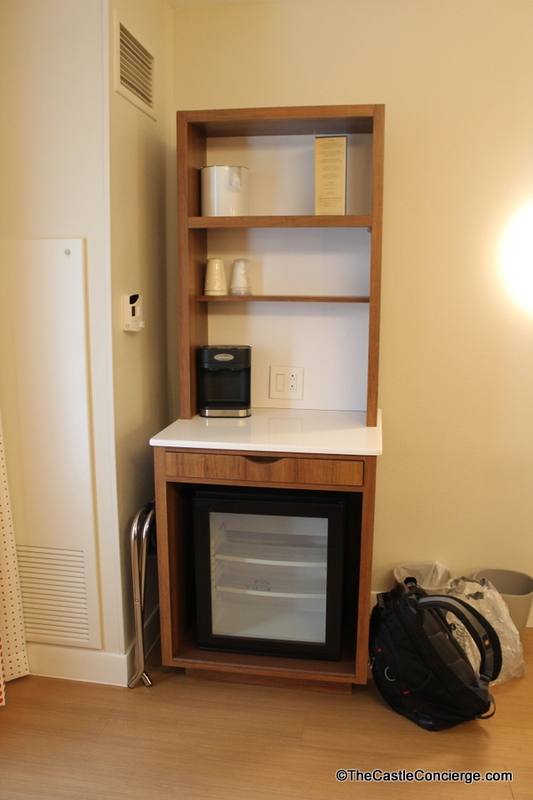 The refrigerator has a see-through door. Laminated flooring has replaced the carpet. 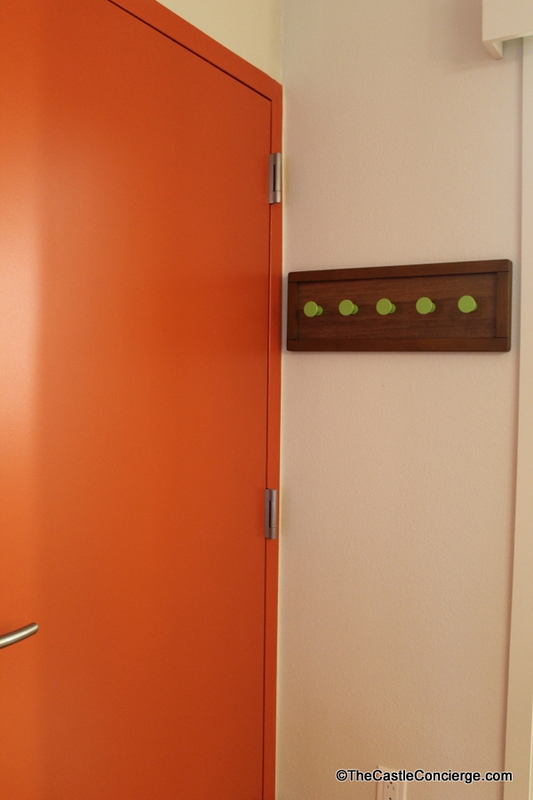 The wood grain pattern works well in the room. 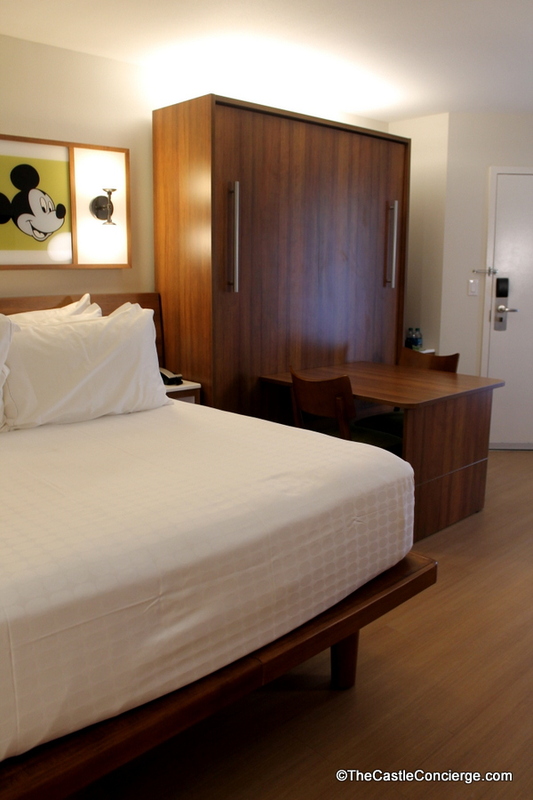 Laminate “wood” flooring at Disney’s Pop Century. I like the wood look to the flooring. It’s also easier for Mousekeeping to clean. 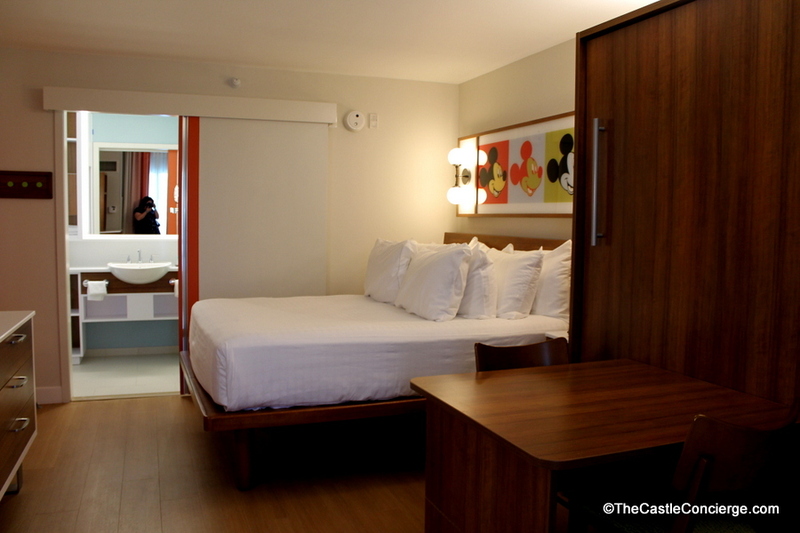 Sliding doors separating the bedroom and bathroom are similar to Coronado Springs Resort. 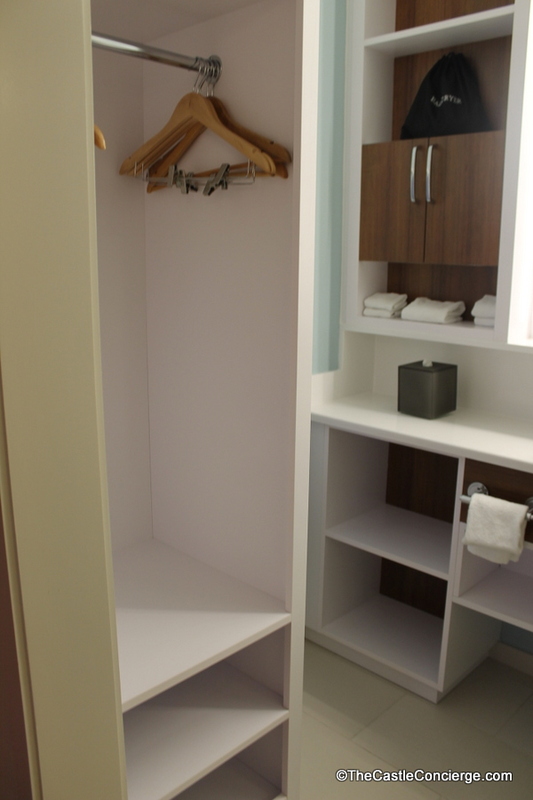 The bathroom also has handy storage units and the shower looks like it’s going to be great for sore muscles after returning from the parks. 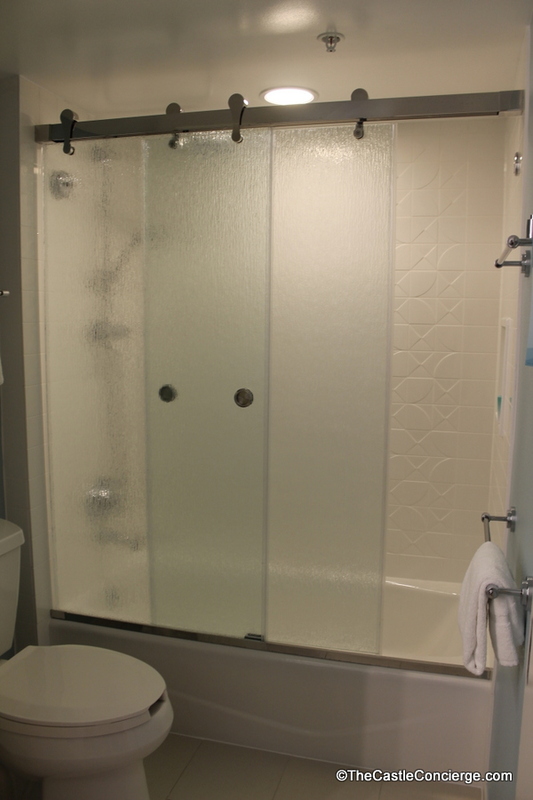 Sliding glass shower doors are a nice addition and they provide some privacy with patterned glass. 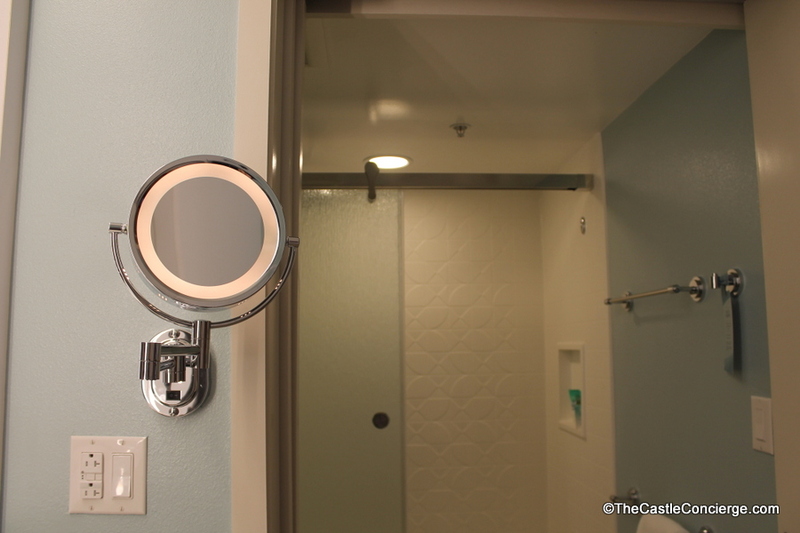 The make up mirror is a really nice touch to the new bathroom decor at Disney’s Pop Century resort. 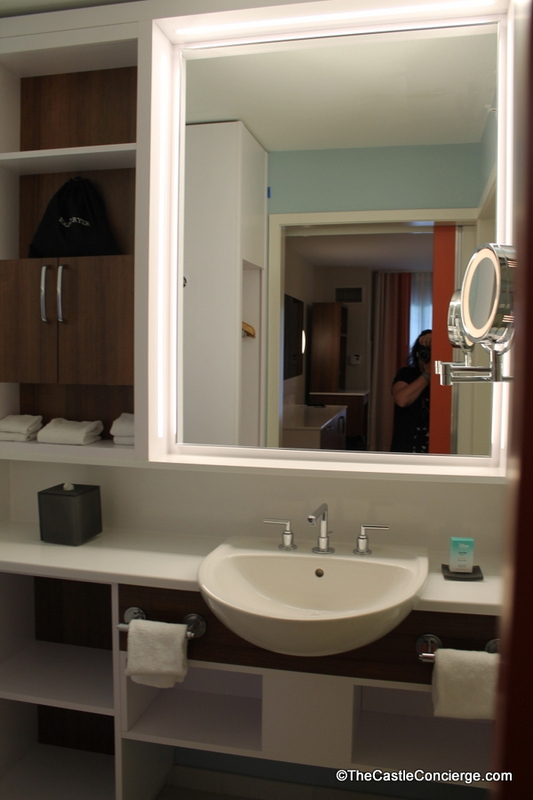 Not pictured: There is a mirror on the bathroom’s sliding door for checking out your snazzy Mickey Ears and touring outfit. 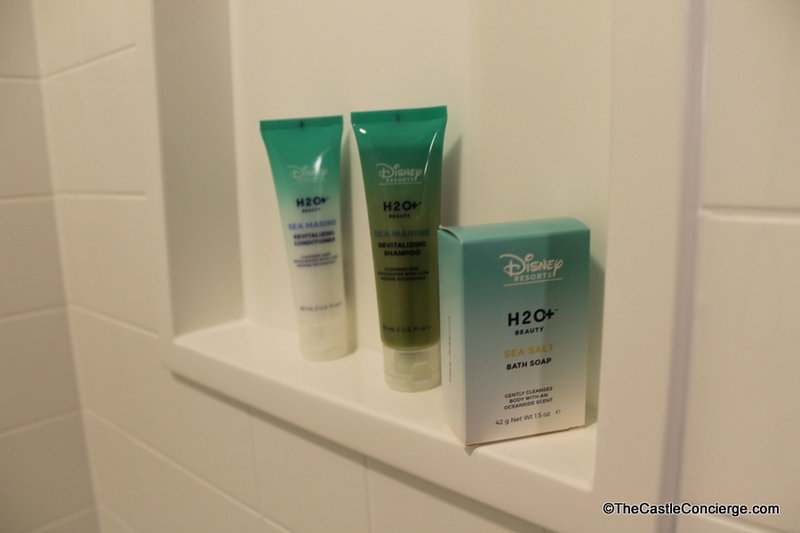 I love the Sea Salt H2O+ products. 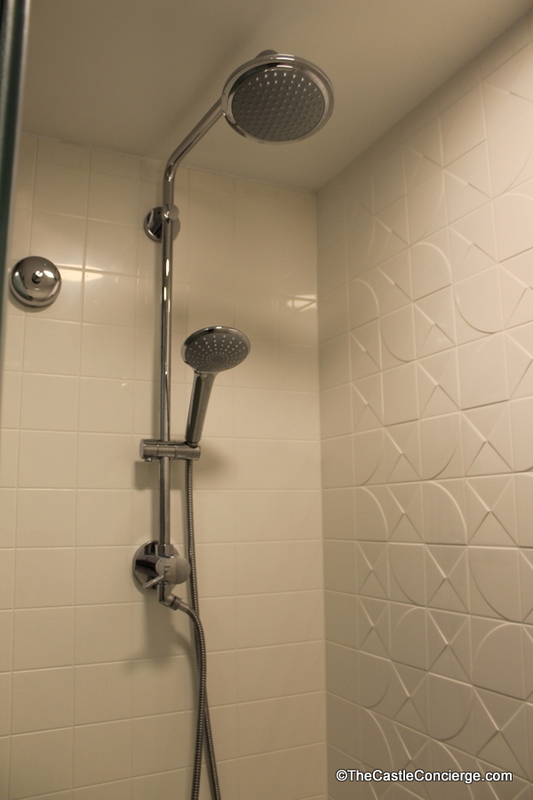 The rain shower was soothing. 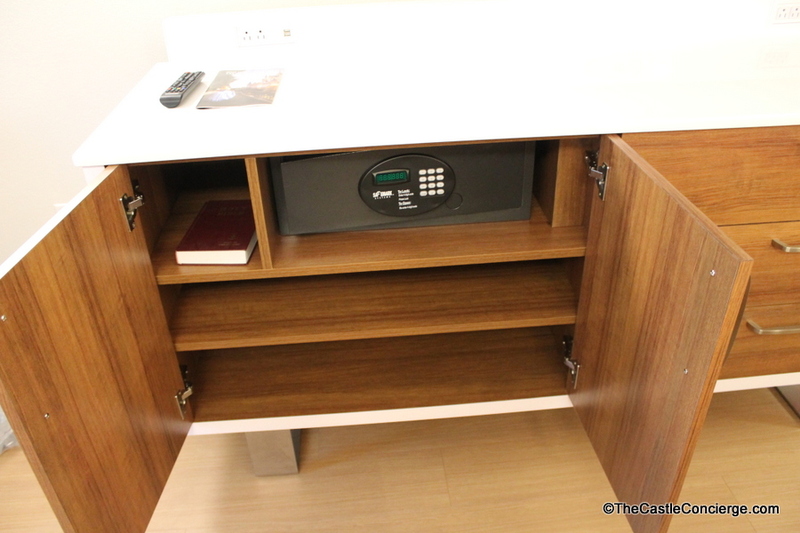 A safe is found inside the dresser. 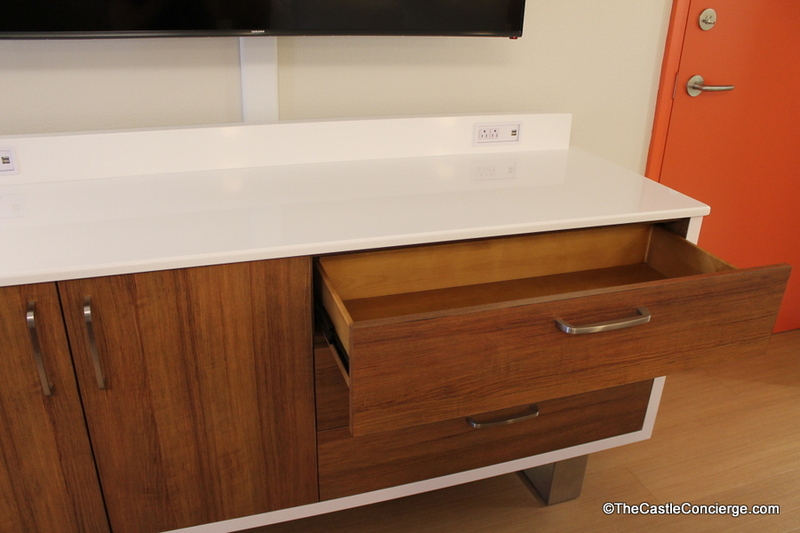 The table is a murphy bed, which was very easy to unfold. 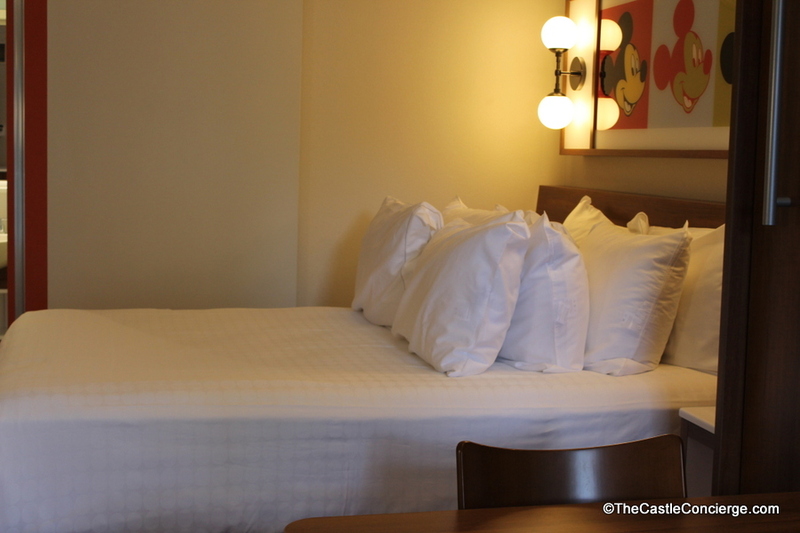 You’ll find eight pillows already in the room. 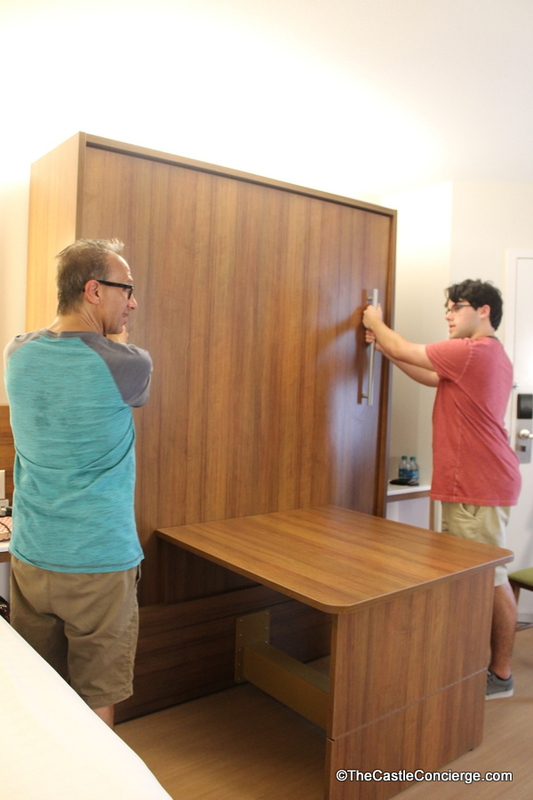 The boys felt that setting up the Murphy bed was very easy; they even mentioned that I would be able to fold it down myself. Our 17 year old son slept on the Murphy bed. He’s almost 5 ft 11 inches and thought the bed was very comfortable. 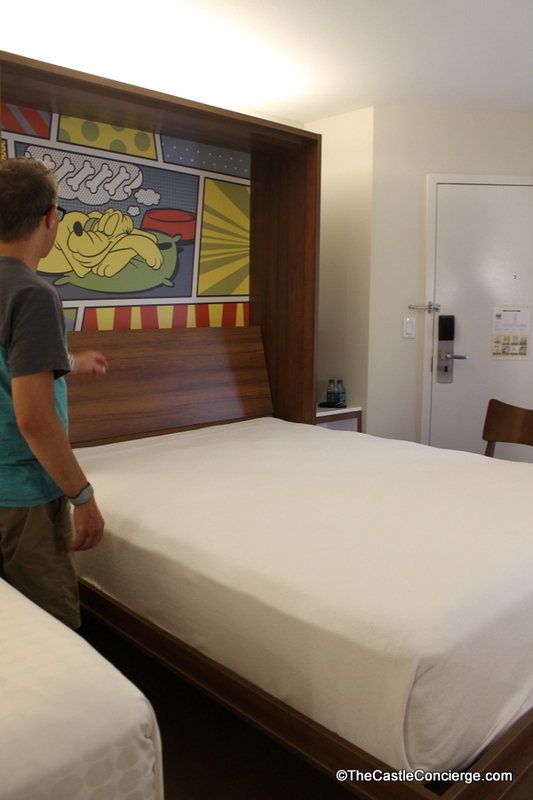 Again, the mattress was firm but comfy. He also thought the pillows were great. 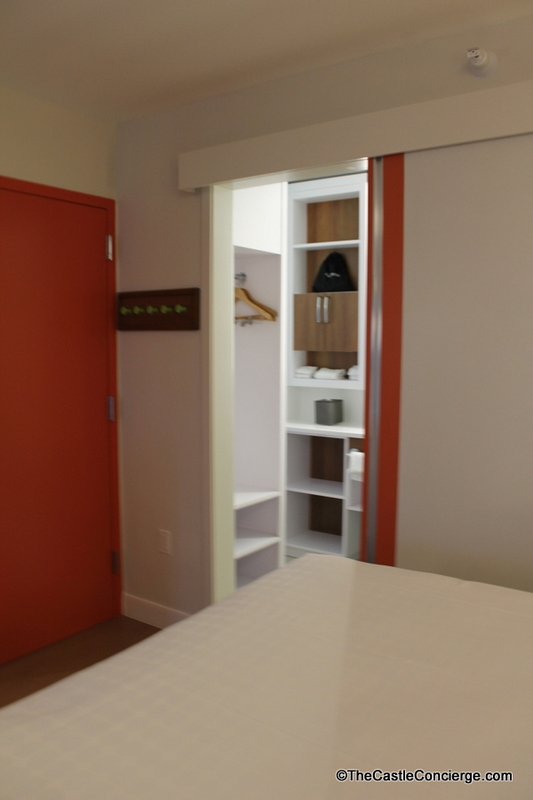 The Murphy bed is already made up with sheets and a blanket. 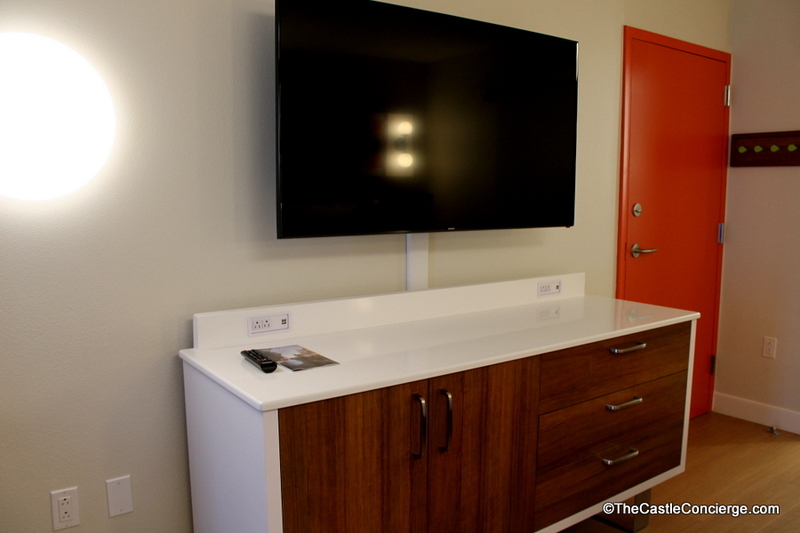 There is a switch for the nightlight in the middle of the headboard. 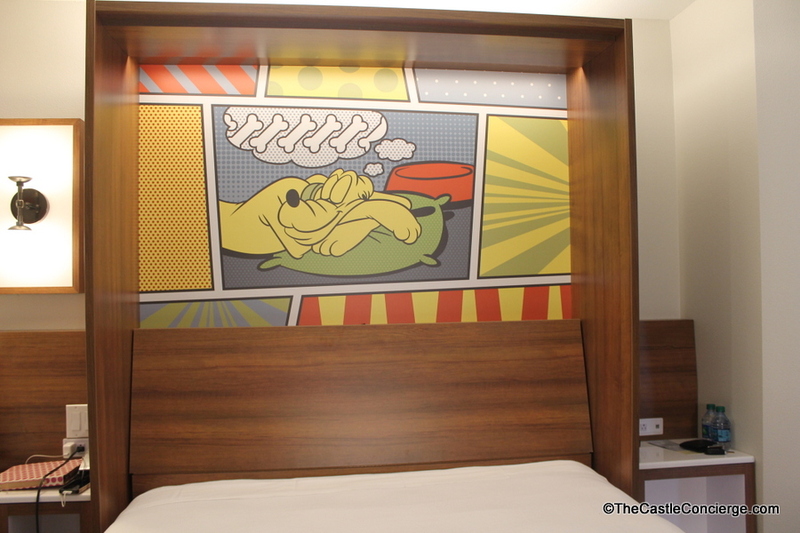 Upon opening the bed, you’ll find Pluto already sleeping! 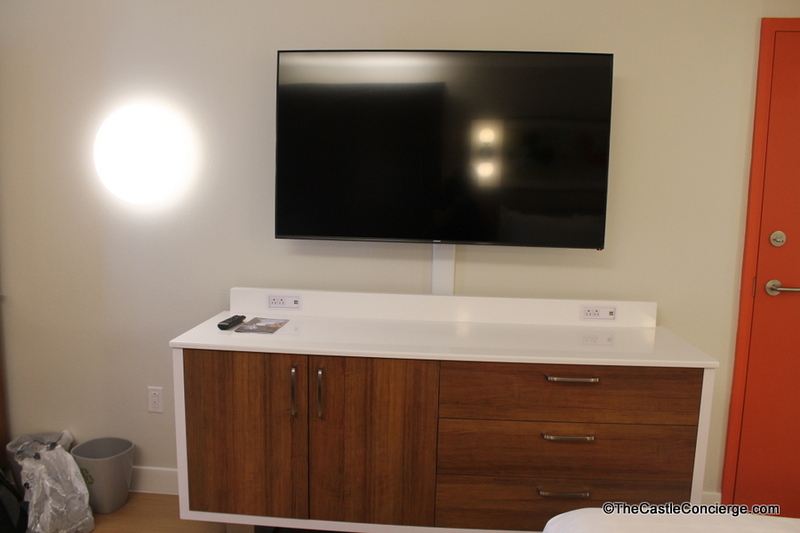 The TV is huge and storage seems quite adequate. 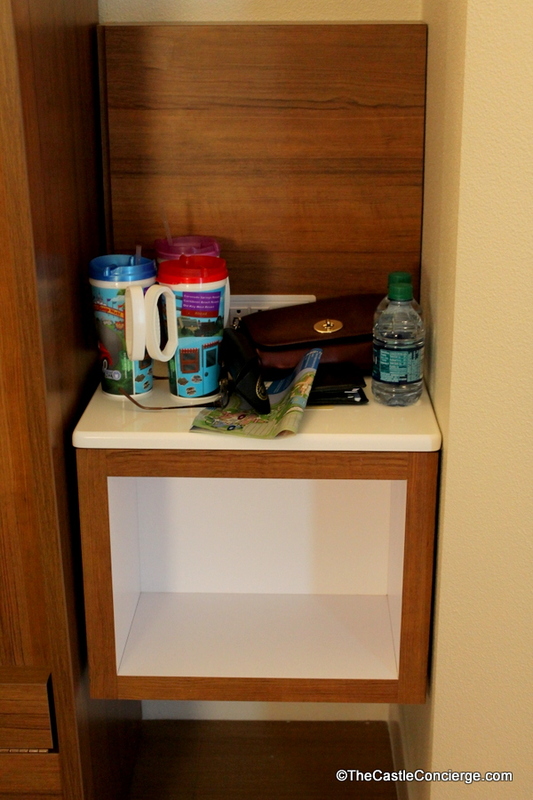 The safe is inside the dresser. 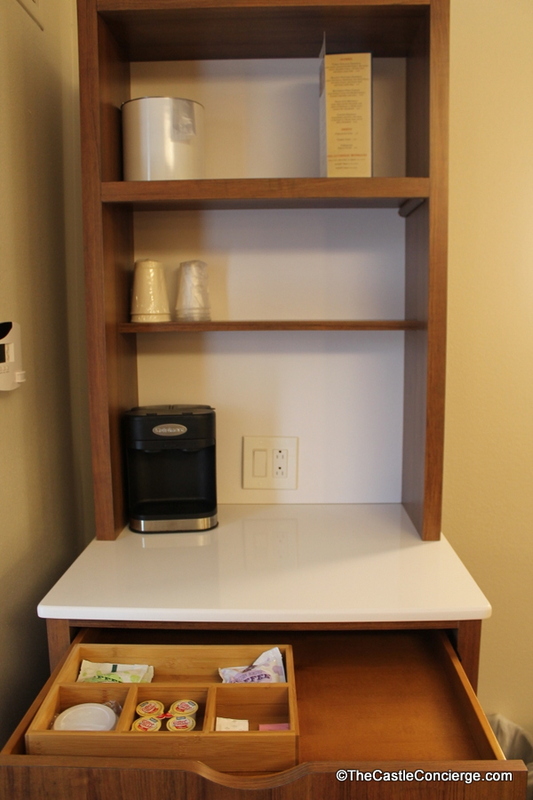 There are plenty of places to plug in your electronics into outlets or USB charging ports, including on the dresser and at each bedside. 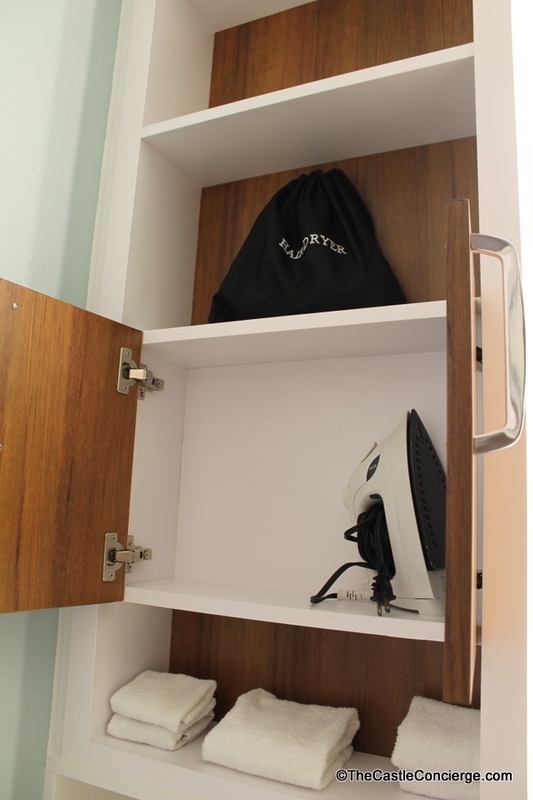 Yes, at first glance the room may seem stark. 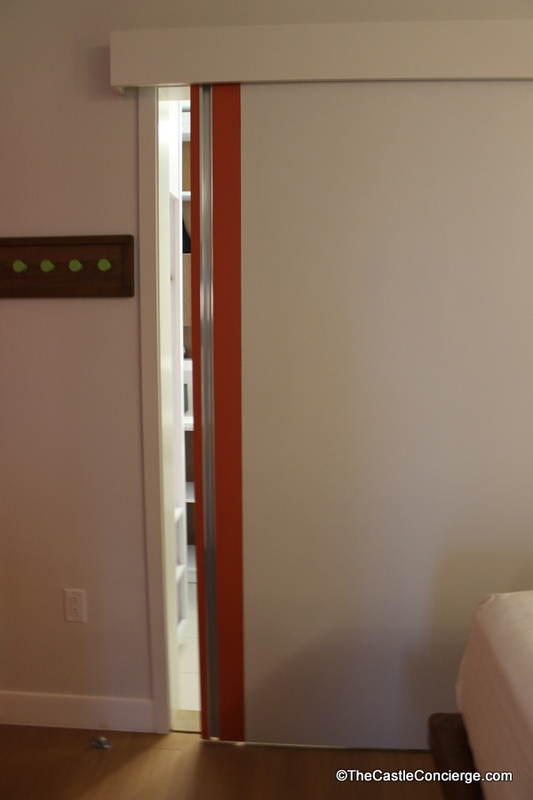 Personally, I think an accent wall with a painted color would be nice. 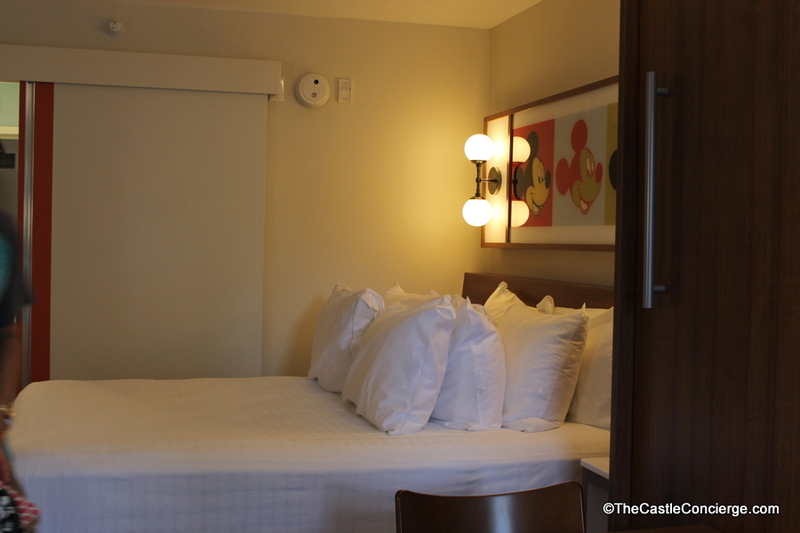 However, the overall refurbishments really adds comfort to this value resort at Walt Disney World. 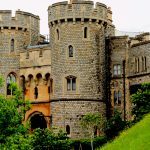 Take a look at the pictures and I’ll return with further updates very soon. 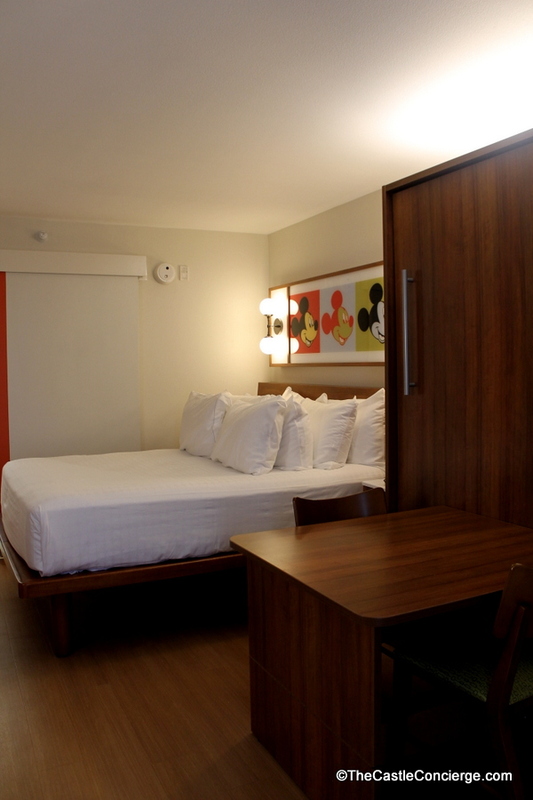 Share your thoughts on the renovated rooms at Disney’s Pop Century! 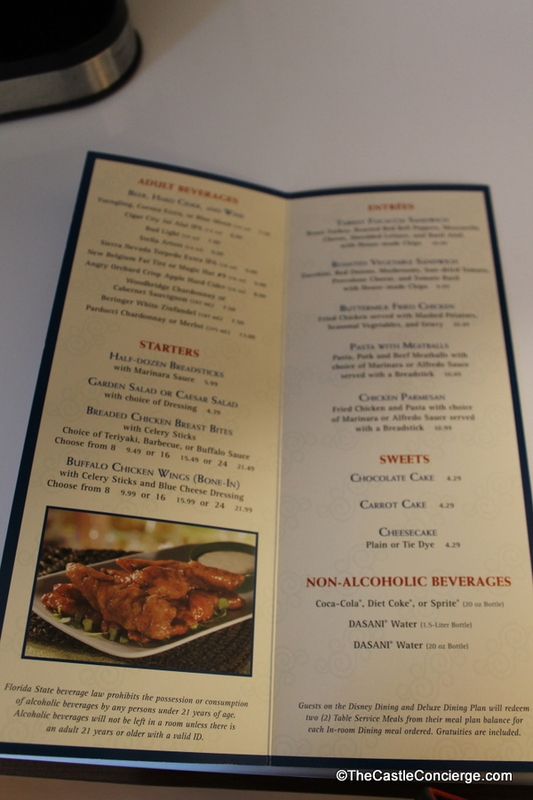 Contact Us, Follow Us on Twitter or comment below to let us know what you think! 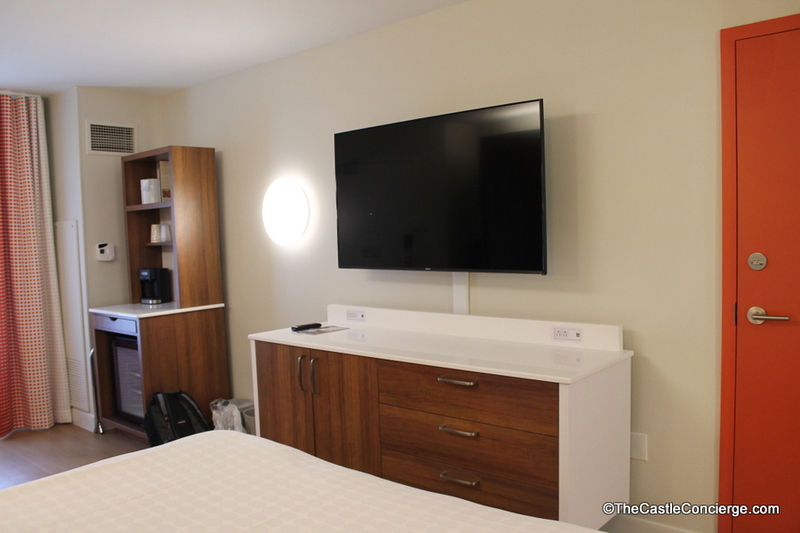 Do you think there would be room for a single air mattress on the floor of the refurbished rooms when the Murphy bed is down? Our kids are too big to share a double bed now but I’d love to get a refurbished room if it would work. Thanks for your great question. 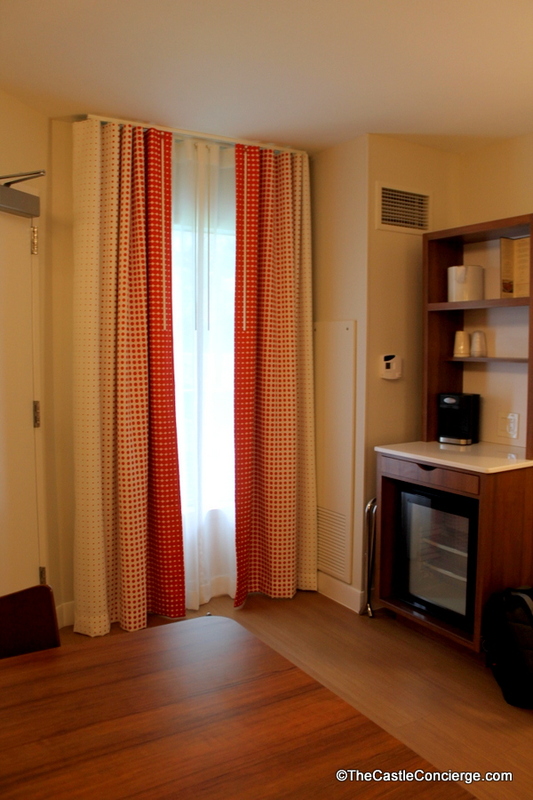 There would be room for an air mattress by the window/door. 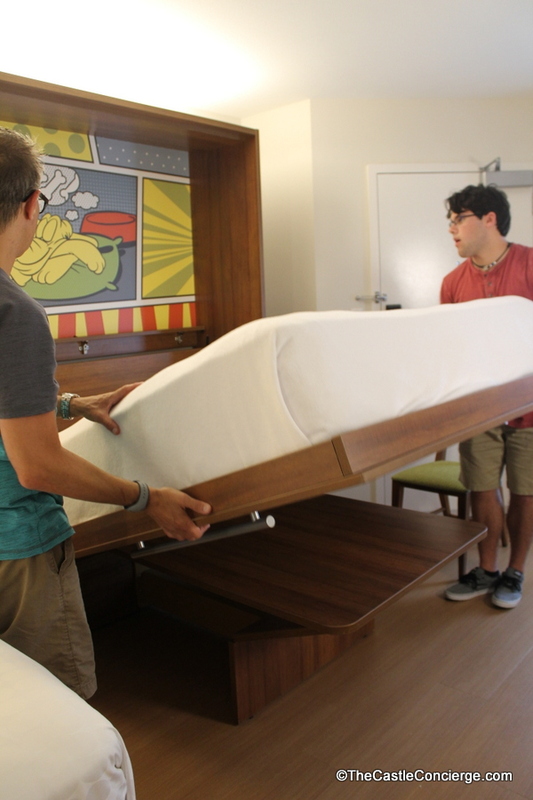 Definitely not enough room between the bed and the murphy bed when it is down. Both mattresses are queens so they take up a lot more floor space now. 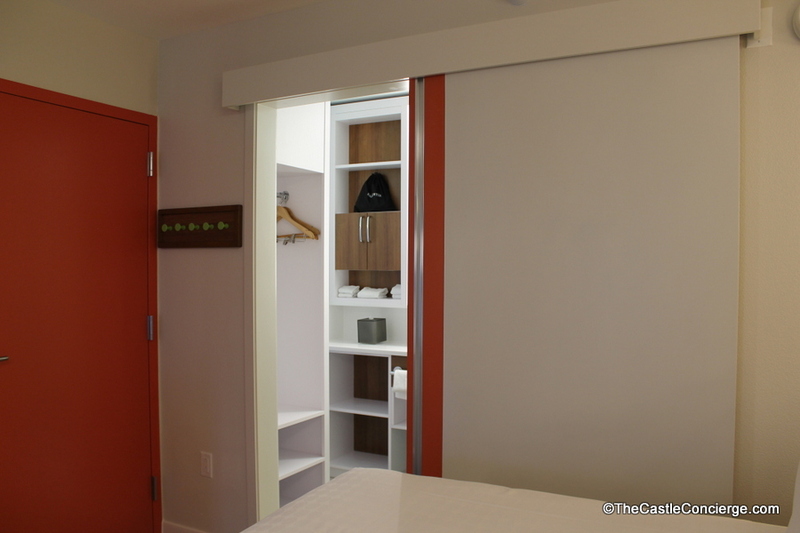 There might be enough room at the end of the regular bed but the murphy bed is longer when it’s down due to the wider headboard. I think you could get creative; just be aware that there wouldn’t be a lot of walking space once the air mattress was set in place. If you try it out, stop back and let us know how it worked out for you. 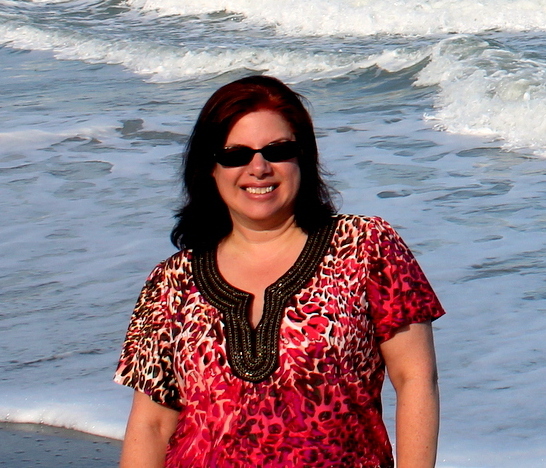 I’d love to share your firsthand account with our readers. 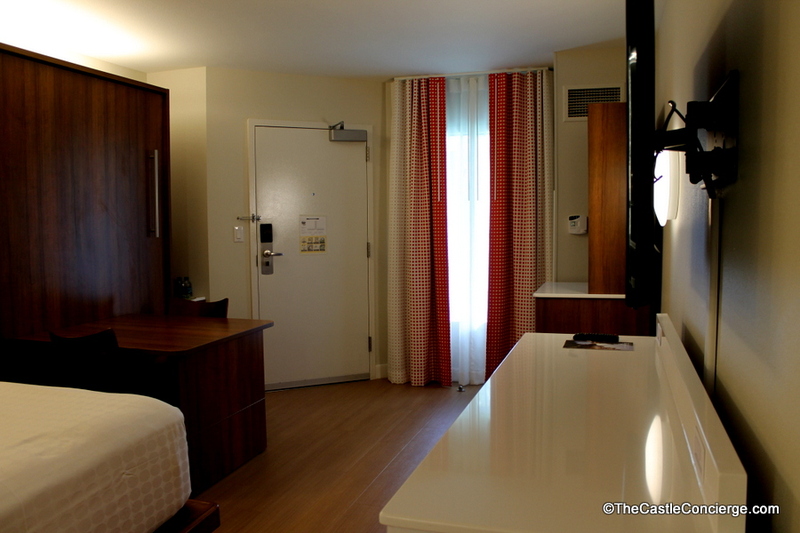 I’d agree, these rooms were pretty small to begin with, almost like a Disney Cruise cabin. 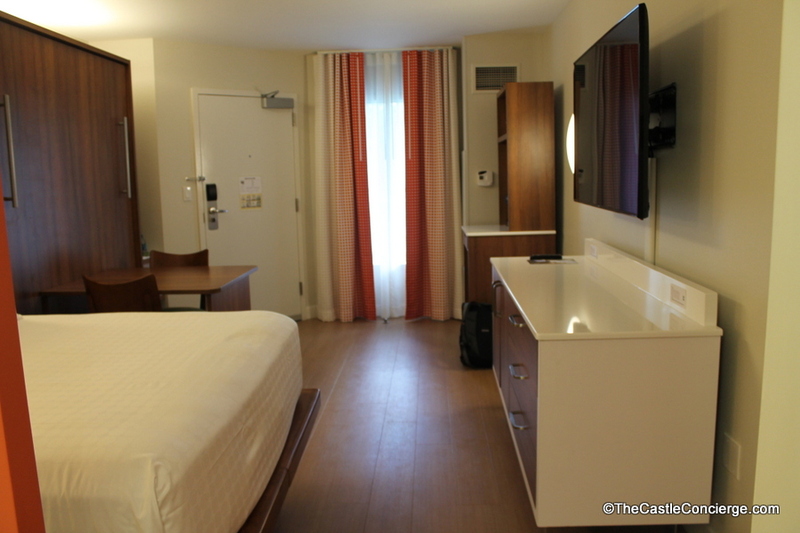 And when I tried to squeeze a scooter in there it was pretty tight compared to other (non-Disney) hotel rooms. 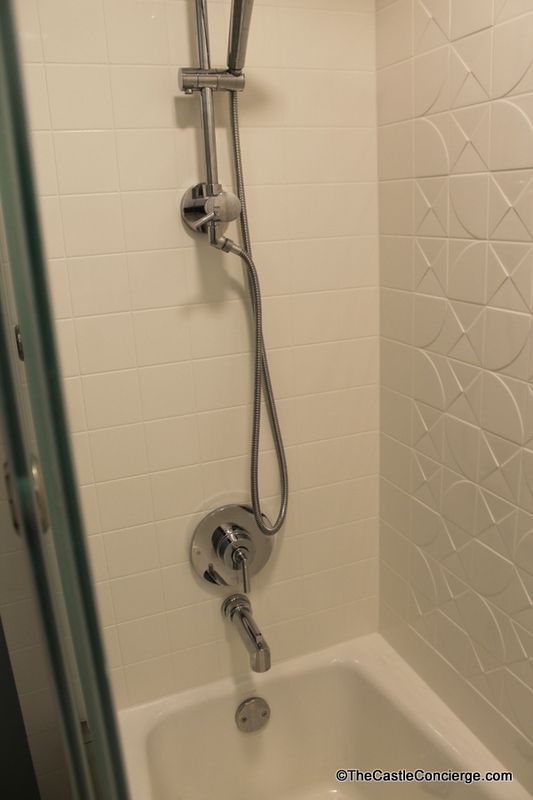 Ironically the new shower reminds me of the shower configuration on the Disney cruise ships. 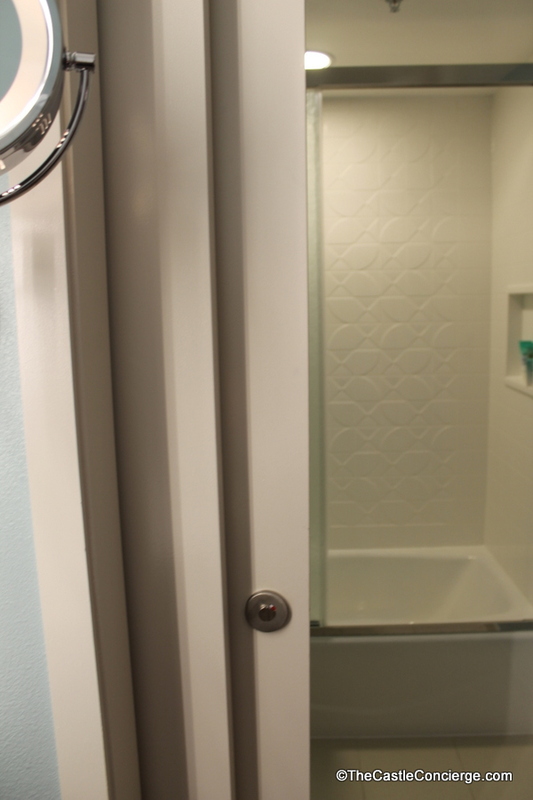 Jeffrey, great insight on the new shower configuration. I was trying to figure out what it reminded me of and yes, it’s got that stark cruise ship look! Thanks for pointing that out. Thanks so much for all of these pictures! 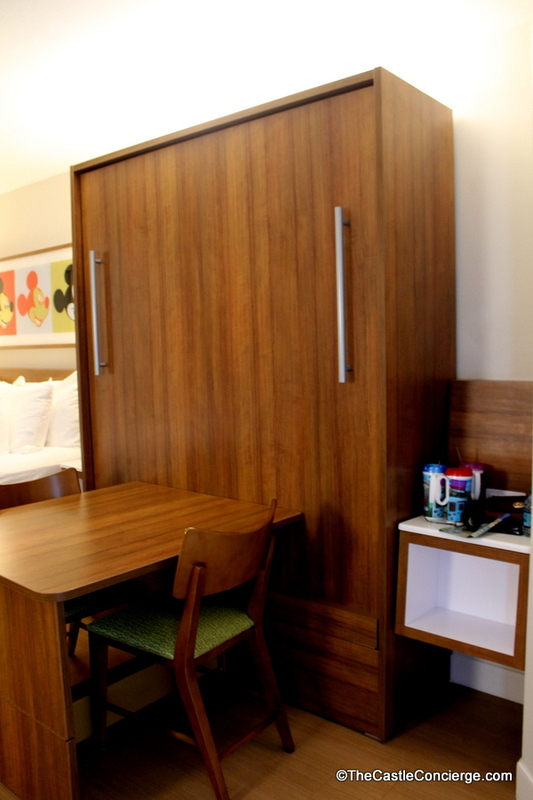 I am beyond excited about this room. 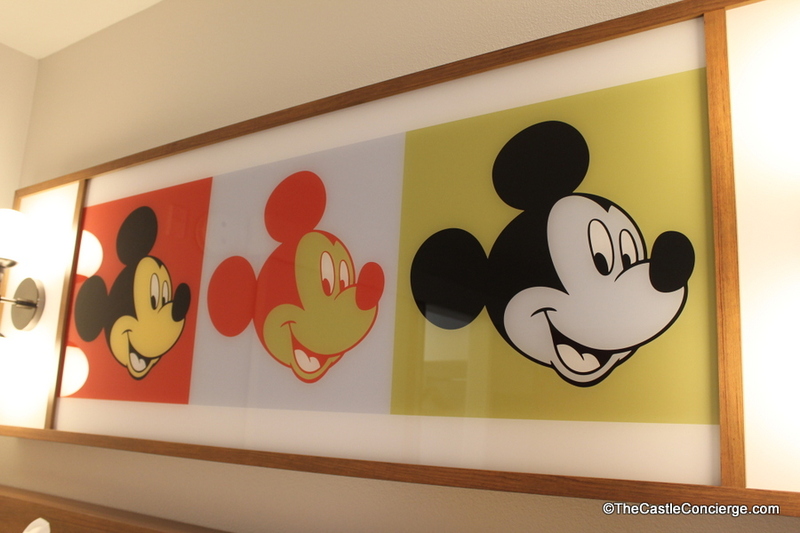 Pop Century is one of my favorite resorts and this makes it even better! 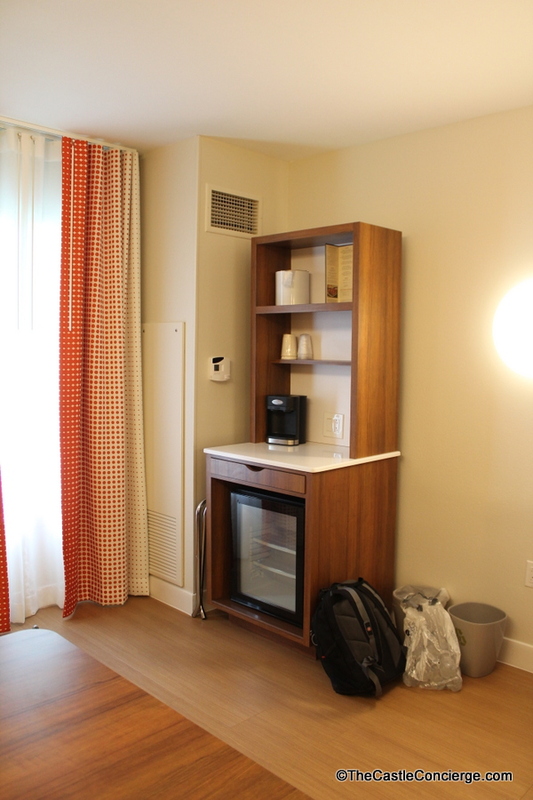 Queen bed and in-room coffee? Yes please. 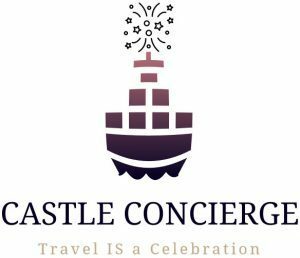 🙂 Tried to add a night on to our stay in September but it was booked up. I’m sure we will stay there again soon. 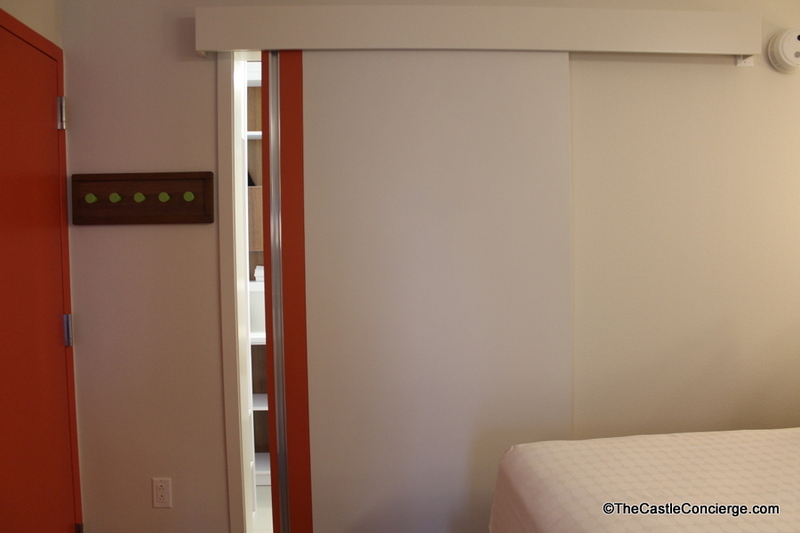 Is the Murphy bed also queen sized? 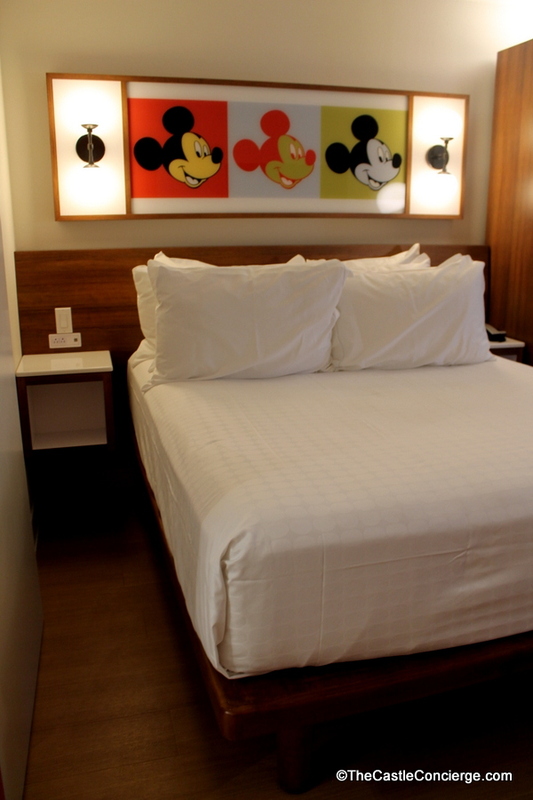 Booked a reservation at Pop Century for next year. 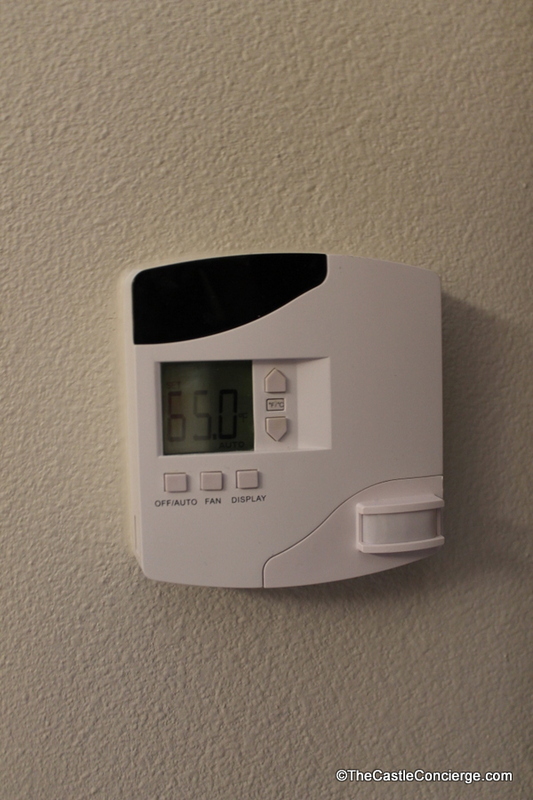 It won’t be in the 90s building, though, since it’s a preferred room. Hopefully they won’t have gotten to them by the end of next year. I don’t like them at all! I want color! Boooo! Peggy, Hooray for 2018 WDW trip! 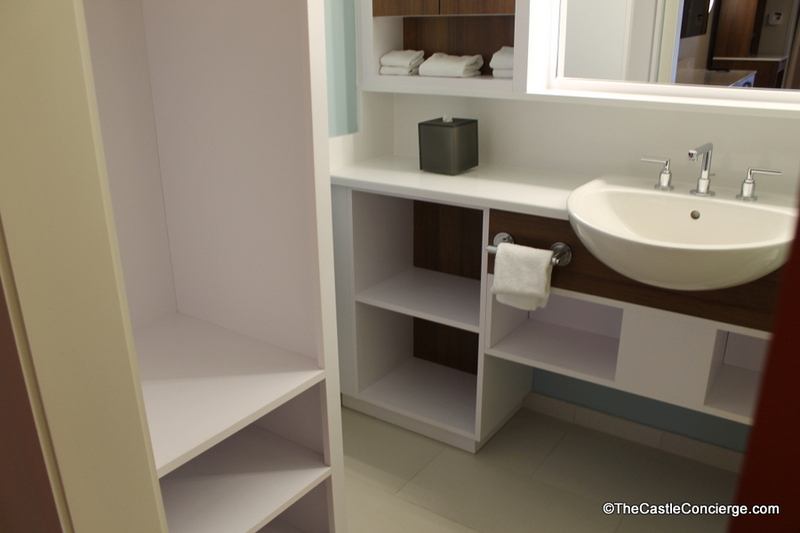 You make an excellent observation; the lack of color makes the room seem too sterile. We just got back and stayed in the 80’s section. 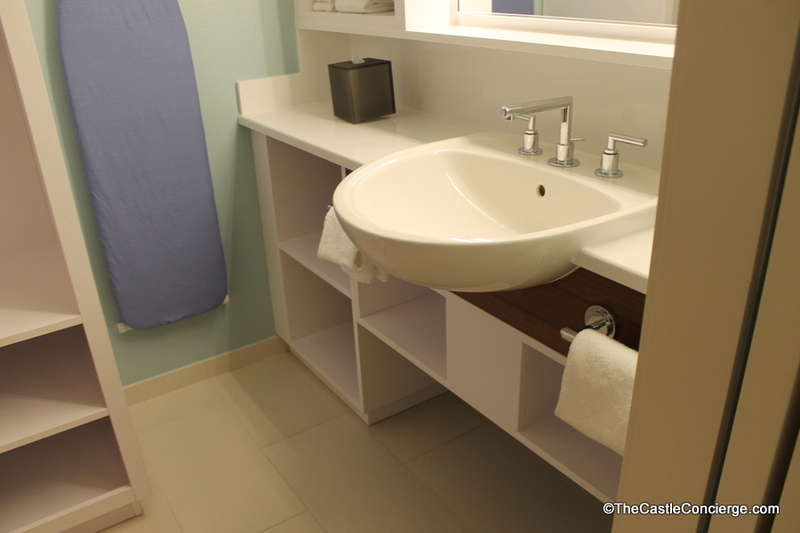 Our room looked exactly like yours, but we only had a shower, no tub. 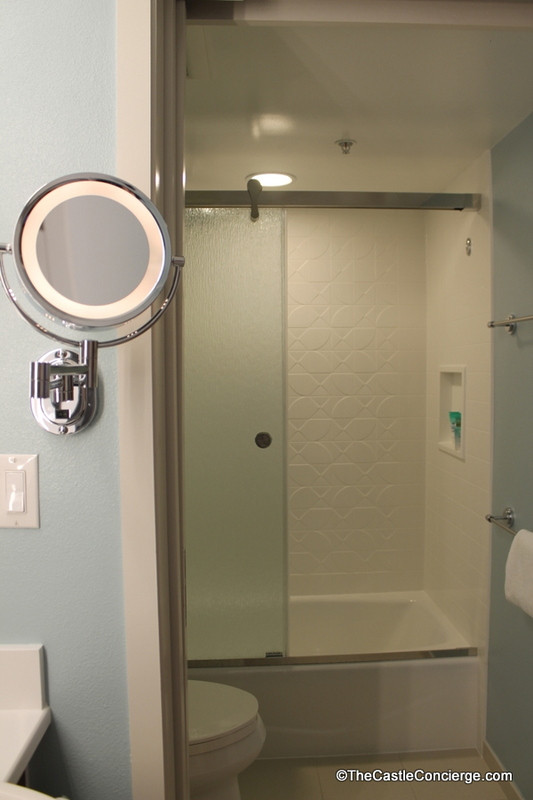 Hubby got terrible blisters his first day and we had no way to soak his feet (no hot tubs in value resorts) 🙁 Do you know how one gets a bathtub? We found the room very stark and boring. 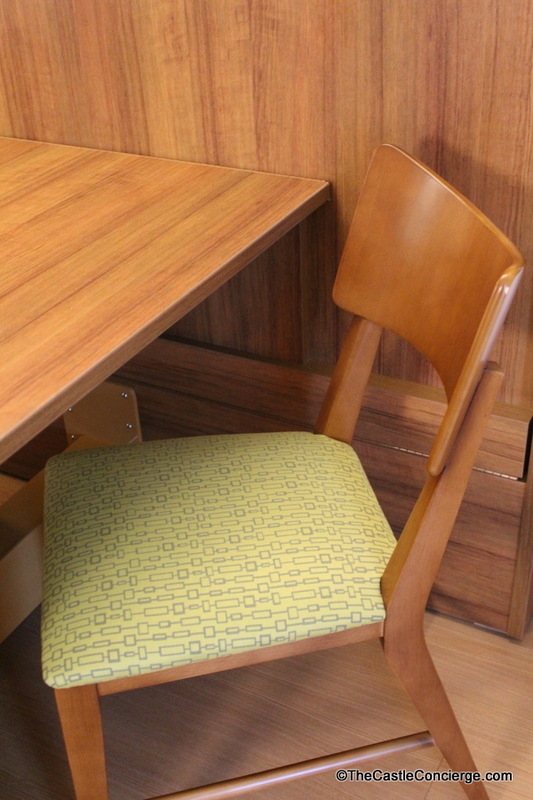 We had hoped for some retro decor that reflected the era we stayed in. Our floor was also dirty, so I’m not sure the wood floors were a plus for us. Hi Carol, I appreciate your feedback and observations. 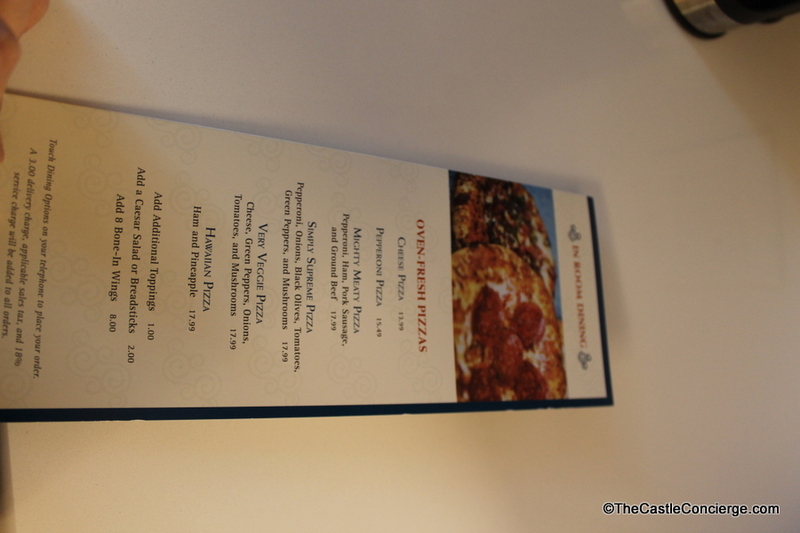 It’s very helpful to hear from fellow Disney guests. 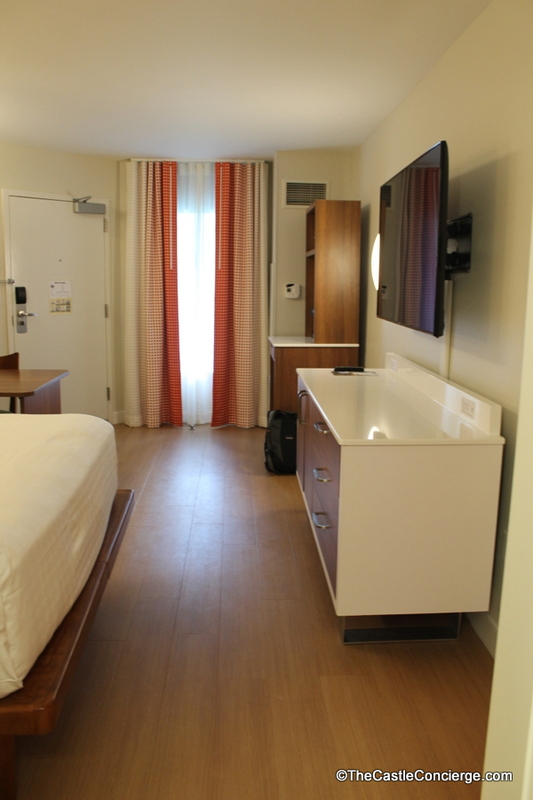 Next time, call the Front Desk after you get to your room and ask for a transfer to a room that better meets your needs. 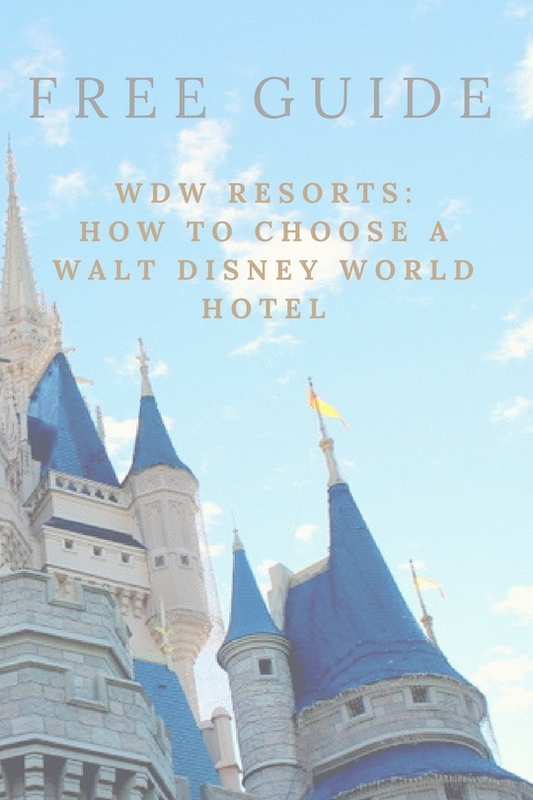 Usually, a Cast Member will be able to get you in a different room and sometimes, they’ll send Bell Services (without having to ask) to help you move. I’m not thrilled to hear about the dirty floors. Yuck. We are going in just a couple of weeks. I would love the extra bed space. 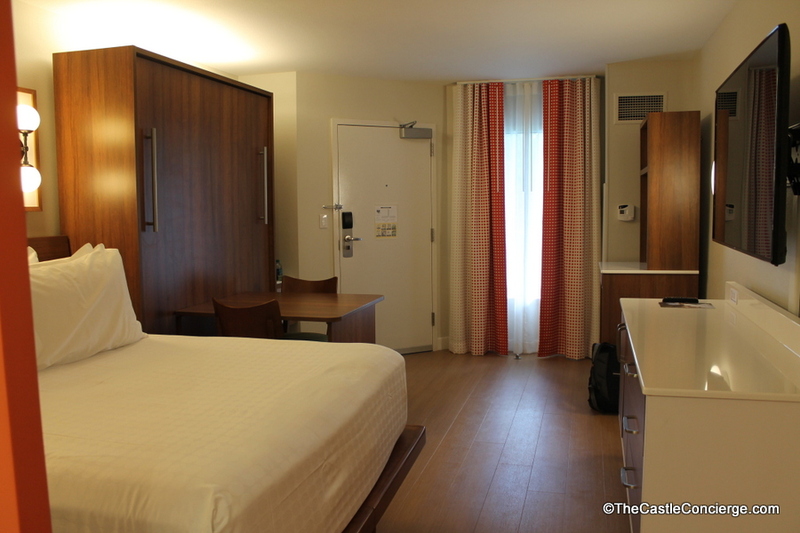 Do you think standard rooms are updated by now?